Torrey Pines finished as the CIF San Diego Section runner-up for the third straight year, as the Falcons dropped a 3-0 decision to Serra in the open division championship game. Torrey has now won 16 straight Palomar League games stretching back to October of 2013. Meanwhiule, their three loses was one short of the school record (two defeats) set by the 2002 team that won the CIF championship (and featured a senior by the name of Jessica Javalet). Ryan Poe scored off a Sammy Cirino pass early in the first half and the Falcons weathered a flurry of short corners late in the game as Torrey Pines beat defending Division I champs Scripps Ranch 1-0 to book a place in the San Diego section CIF championship game this Saturday. The Falcons will play defending Division II champs and No. 1 ranked Serra, which beat LCC 2-1 in the other semifinal on Thursday. Down by two goals with less than 10 minutes to play in regulation, Torrey Pines rallied to tie the game and beat Rancho Buena Vista in overtime to secure a place in the CIF semifinals for the third straight year. Sophomore sensation Sophia LeRose scored three goals, seniors Gabi Jimenez and Shannon Yogerst once apiece to lead the Falcons attack. Farah Farjood had two assists, while Rylie Pope and Yogerst contributed one each. Jimenez scored in the first half, a reserve sweep off a short corner pass from Yogerst. But the visiting Longhorns soon sprinted to a 3-1 lead against the favored Falcons. The clock ticking down, all looked lost for Torrey until LeRose and Farjood hooked up for a pair of late goals (on short corners) that forced overtime. Yogerst earned the winner about four minutes into overtime, attacking into the circle at the end of a 30-yard sprint and blooping the ball over the RBV keeper's outstretched stick. LeRose added an insurance goal in the final minute on a pass from Pope. And suddenly the Falcons found themselves headed for a semifinal appearance with Scripps Ranch on Thursday. Torrey Pines beat Westview 6-0 on Senior Night to wrap up a perfect (10-0) Palomar League season and set themselves up for a top three seeding for the CIF playoffs next week. The Falcons said goodbye to nine seniors, several of them four-year starters for Torrey. As the power rankings now stand, the Falcons will most likely play Rancho Buena Vista at home on Tuesday, November 17th, although that could change depending on how other teams perform this week. More details to come . . .
Torrey Pines earned its third straight Palomar League championship with a resounding 10-0 victory over Rancho Bernardo and a cold and rainy night at Falcons Stadium. Even though head coach J.J. Javalet nd several starters were sidelined by illness, the rest of the team easily picked up the slack as the No. 3 ranked Falcons notched thier 13th straight win. Senior forward Sammy Cirino knocked in a season-leading four goals for the Falcons, freshman forward Kristin Bitter notched two, while Gabi Jimenez, FarahFarjood, Ryan Poe and Emily Belshin logged one goal each. Sofia LeRose earned three assists, Belshin had two, Jimenez and Farjood one apiece. Sophia LeRose scored off a Gabi Jimenez pass around midway through the first half, a goal that kick-started the lackluster Falcons attack. One minute later, Jimenez found the back of the cage on one of her classic reverse chips. Jimenez made it 3-0 on a short corner inssert from Rylie Pope. The same duo (Jimenez and Pope) upped the score to 4-0 on another Torrey corner. Sammy Cirino scored with just 20 seconds left in the half to give the Falcons a five-goal margin. Early in the second half, Emily Belshin slammed a pass from Cirino into the cage. Lucy Clark finished off the Falcons scoring with a goal on the left post with 19 minutes to play. Poway High School may have relegated their varsity field hockey team to a far-off grass field in favor of a freshman football game in the stadium. But the Falcons had no problem adjusting to the lawn, running up an early lead and coasting to a 4-0 win over the Titans. Torrey has a two-game lead with just three games to play in the Palomar League season. The Falcons can clinch at least a tie for the league title on Monday when they host Mt Carmel at home. Torrey took the lead six minutes into the first half on a goal by Sofia LeRose off a pass from Sammy Cirino. LeRose scored again just five minutes later when she tipped in a Gabi Jimenez shot from outside the circle. The Falcons went up 3-0 before halftime when Emily Belshin found the back of the cage after a LeRose pass. LeRose earned her hat trick on the only Torrey goal of the second half, this time off a dish from Cirino. Torrey Pines took a huge steps towards winning its third straight Palomar League field hockey title with a resounding 4-0 win over Canyon Crest on Wedneday afternoon in the Ravens' new stadium. Sammy Cirino scored twice, Shannon Yogerst and Rylie Pope once each as the Falcons beat their arch-rivals for the fifth straight time. The Falcons earned 15 short corners to just two for the Ravens, and got off more than 20 shots on goal versus only three for the home team. If somebody was measuring time of possession it would have been somewhere around 80:20 in favor of the Falcons. Torrey Pines dominated possession from the opening tap, but struggled to get the ball in the cage, failing to score on eight corners over the first 15 minutes. Cirino finally put the Falcons in the lead on a slap shot from about five yards in front of the Ravens goal at the 13:12 mark. The Falcons extended their lead about midway through the second half and a Yogerst rocket from the top of the circle off a pass from Farah Farjood. Cirino scored her second goal on a fastbreak pass from Sophia LeRose with around 11 minutes to play, while Pope rounded out the Torrey scoring when she found the back of the cage out of a scrum with six minutes left in the game. CCA threatened late, but Jaden Watkins made a couple of great saves and Brynn Froehlich thwarted a Ravens fastbreak by running don the attacker from behind to preserve the shutout. Ryan Poe earned her first varsity hat-trick and Torrey finished the first half of the Palomar League season undefeated and in solo possession of first place as the Falcons thrashed Westview 7-0 on Friday afternoon on the road in PQ. Once again the Falcons put on an impressive offensive display, getting off an astounding 36 shots on goal against Wolverines' all-star keeper Chelsea Bigelow. This is how Torrey engineered the win . . .
Sammy Cirino tipped in a shot by Shannon Yogerst just four minutes into the first half fror what turned out to be the winning goal. Gabi Jimenez scored on a reverse chip 11 minutes into the half. Just two minutes later, Ryan Poe found the back of the cafe on a pass from Jimenez. Jaden Watkins blocked the only Westview shot on goal at the end of a Wolverines fast break. Poe tipped in a shot by Jimenez that may have also rebounded off a third person's stick. Cirino scored again when she tipped in a Jimenez shot from the top of the ciricle and the Falcons went into halftime with a 5-0 lead over the Wolverines. Poe earned her hat-trick about 10 minutes into the second half when she tipped in a Farah Farjood shot that came during Torrey's 13th corner. Jimenez finished the Torrey scoring with another reverse chip goal (over the keeper's head) in the game's final minutes. LeRose tipped in a Poe shot about five minutes into the first half. Poe made it 2-0 of a short corner give-and-go play with Shannon Yogerst and Jimenez. Jimenez scored on a rocket shot off a pass from Farah Farjood on Torrey's fourth corner. LeRose tipped in a Meaghan Donnelly shot for a 4-0 lead 18 minutes into the game. Jimenez found the back of the cage on a reverse tip and the Falcons went into halftime with a five-goal lead. Lucy Clark scored her first goal of the 2015 season when she knocked in a refound off the right post. Farjood tipped in a Jimenez shot to on Torrey's 10th corner to make it 7-0. Poe rounded out the Falcons scoring with a dish from Jimenez. Torrey continues Palomar League play next week with games against Mt Carmel and Westview. Gabi Jimenez scored twice to lead Torrey Pines to a 3-1 win over Poway on Wednesday afternoon at Falcons Stadium. Despite surrendering nine short corners in the early going, it was the visiting Titans who grabbed the lead first, scoring on a pass straight across the goal mouth that beat Torrey keeper Jaden Watkins. Less than three minutes later, a Poway defender blocked a Falcons shot with her foot and Rylie Pope blasted the ensuing penalty stroke past the Titans keeper to tie the score. Both Jimenez scores came in the second half, the first on a reverse chip around the 18-minute mark and the second on a rocket from the top of the circle with about six minutes to play. The JV Falcons beat the little Titans 1-0 in the opener. No. 3 ranked Torrey Pines opened Palomar League play in spectacular fashion with a convincing 4-1 win over No. 4 ranked Canyon Crest Academy on Friday afternoon in Falcons Stadium. It was the Falcons' fourth straight victory over their fierce Carmel Valley rivals. The Falcons earned a flurry of short corners early in the game. But it was the Ravens who struck first, scoring on their first penalty play around the 17 minute mark. But rather then demorlize the Falcons, the CCA goal seemed to steady their resolve. How appropriate that someone named Poe (Ryan, not Edgar Allen) should even the score with the Ravens, a rocket shot from the top of the circle with a dozen minutes left in the first half. Torrey kept up the offensive pressure, grabbing the lead with three minutes till intermissias Shannon Yogerst whipped around a Raven defender and passed to Sammy Cirino on the right post for the goal. Determined to build their lead, the Falcons picked up where the left off early in the scond half. After Kristin Bitter earned the home team's sixth short corner, Gabi Jimenez scored on a reverse chip to make it 3-1 Torrey. Meanwhile, the midfield nd defense was stifling the normally high-powered CCA attack. The Ravens could barely push the ball pas the 50 yard line and didn't penetrate the Falcons circle until there was less than 1 minutes to play, when they finally earned their second short corner of the game. Moments later on a Torrey counterattack, Yogerst drew another Falcons corner and Jimenez reponded with another mighty blast past the shellshocked CCA keeper. Jaden Watkins preserved the three-goal margin with an outstanding save in the final minutes. Game notes: Torrey earned 13 short corners to just three for Canyon Crest . . . the Falcons are tied with Poway (their next opponent) and Westview at the top of the early Palomar League standings. The JV Falcons dropped a 2-0 decision to the visiting Ravens. Torrey Pines earned 28 short corners and scored six times in the second half on the way to a 6-0 victory over Cathedral Catholic at Falcons Stadium. With the decisive victory over the Dons, the Falcons finished the first half of the season with 12 wins and just two losses -- their best pre-league record since 2004 and even better than the 2008 team that won Torrey's last CIF title. The Falcons back six of Farah Farjood, Rylie Pope, Brynn Froehlich, Gabi Jimenez, Meaghan Donnelly and Shannon Yogerst kept the visiting Lady Dons from crossing midfield for almost the entire game. An easy day for keeper Jaden Watkins, Cathedral didn't get off a single shot on goal. Meanwhile, Sammy Cirino, Ryan Poe, Sophia LeRose, Emily Belshin, Kristin Bitter and Arielle Shahrabani were leading a blistering attack at the other end of the field. Farjood made it 1-0 on short corner No. 14, a rocket from the top of the circle that deflected into the cage off a defender's stick. LeRose scored on a dish from Jimenez on short corner No.22 . Cirino knocked in a pass from Yogerst on the Falcon's 23rd short corner. LeRose tallied again -- on another feed from Jimenez -- on the 24th corner. Shahrabani scored the first goal of her Torrey Pines career on corner No. 26 when the ball scooted loose from a scrum in front of the Cathedral cage. Jimenez rounded out the scoring with a brilliant reverse-chip goal with just a few minutes to play. Next up for the No. 3 Falcons: a Friday afternoon showdown with Carmel Valley rival and No. 4 ranked Canyon Crest Academy, the first Palomar League game for both teams. Meanwhile, the JV Falcons beat the Lady Dons 4-0 in the warm-up game. Gabi Jimenez scored off a penalty corner with around five minutes to play to give Torrey Pines a hard-fought (and well deserved) 1-0 win over archrival La Costa Canyon on the road in Carlsbad on Friday afternoon. The winning goal came on a play very similar to the one that beat RBV just 48 hours before -- a penalty corner play gone wrong that the Falcons somehow managed to salvage and transform into a score. Both teams were slow off the mark in a first half marked by lots of midfield play and way too many referee whistles on both sides of the field. The Falcons won the stats battle by earning four short corners to zero for the Mavericks, but Torrey couldn't put the ball in the cage. One of Jimenez's rocket shots that clanged off the left post and back into the circle 10 minutes into the game. The referee raised her arms to signal a Torrey goal. But it was pretty obvious to everyone in the stands that it wasn't and after a conference the refs disallowed the score. The action picked up after intermission, the agggressive Falcons pushing into the Mavericks circle again and again. As has become the pattern in so many games this season, Torrey came close to scoring on numerous occassions. Sammy Cirino just missed with a shot that went wide left, Sofia LeRose almost scored on another play, and several Jimenez shots were rejected by the LCC keeper. And five straight corners resulted in a grand total of zero goals. With overtime looming, the Falcons earned their 10th corner of the game. The corner play was quickly thwarted by the Mav's defense. But Shannon Yogerst won the scramble for the ball and fired off a hard shot on goal. The ball rebounded off the keeper's pads to an alert Jimenez, who pulled to the right and shot past on LCC defender into the unguarded cage and the second Torrey victory over their archrivals in six days. Next up for Torrey Pines: a doubleheader against Cathedral Catholic on Wednesday afternoon at Falcons Stadium -- first leg of their three-day campaign to win the unofficial Carmel Valley championship. Sophomores Ryan Poe and Sofia LeRose secored second half goals as Torrey Pines slipped past Rancho Buena Vista 2-1 on Wednesday afternoon in Falcons Stadium. The Falcons dominated play in the first half, earning eight short corners. But good goalkeeping and off-target shooting kept the game scoreless going into the half. The Longhorns came out smoking after intermission, but Jaden Watkins responded with her own great saves in the Falcons cage. Torrey finally broke the deadlock four minutes into the half on a fast break up the right side. Shannon Yogerst started the scoring sequence at midfield with a 30-yard pass to Sophia LeRose, who turned and dished off to Sammy Cirino in the circle. Cirino's shot rebounded off the keeper's pads to Poe, who slammed the ball into the back of the cage for a 1-0 lead. Six minutes later the Falcons made it 2-0, as Yogerst tracked down a loose ball on a broken short corner play and passed to Gabi Jimenez, who dished to LeRose for the score. RBV rallied with a goal midway and several short corners. Watkins rejected their last serious attempt with around five minutes left, as Jimenez and Yogerst ran out the clock playing keep-away deep in Longhorn territory. The JV Falcons repelled a penalty corner with no time left on the clock to beat their Longhorn counterparts 4-3. On another sweltering hot day in Tierrasanta, Torrey Pines finished third at the annual Serra Tournament by besting La Costa Canyon 4-3 in a shootout that took the place of a full consolation game. Gabi Jimenez and Rylie Pope were both named to the all-tournament team. The Falcons beat the Panthers for the second time in eight days, scoring all three goals in the first half. Riley Pope scored what turned out to be the winning goal 10 minutes into the first half, smacking the ball into the net off a short corner pass from Sammy Crinino. Eight minutes later Pope repeated the feat on a dish from Gabi Jimenez on another penaltly corner play. Freshman Kirstin Bitter made it 3-0 on a great individual effort, pushing the ball into the Vista goal while on her knees in front of the cage. Torrey nearly scored on several other plays -- Cirino just missing on three shots and Shannon Yogerst hitting the right post on a shot from the top of the circle. Falcons keeper Jaden Watkins blocked a dubious penalty stroke in the second half to save the shutout. The Falcons couldn't summon up the same mojo they used to dominate No. 1 ranked Serra in their previous meeting this season. This time it was the host Conquistadores who dominate play from start to finish with crisp passing, great defense and pinpoint shooting. It didn't help that Torrey had key players missing or ill, because even at full strength they wouldn't have matched Serra's elevated level of play on Saturday. The Falcons took an early lead when Sammy Cirino scored off a dish from Gaby Jiminez five minutes into the first half. But then the Qs ran off a sequence of seven straight penalty corners and several shots between to build a 2-1 lead going into intermission. Serra scored its third goal early in the second half on a deflection off a shoulder-high penalty corner shot. The two teams went into zombie mode after that, the 94-degree heat taking its toll on both sides. Rather than play an entire game for third place, the coaches decided to wrap things up as quickly as possible -- and get out of the sun -- by going straight to a shoot out. LCC took an early 2-0 lead, but then the Falcons fought back as Shannon Yogerst juked right and scored, Jaden Waktkins came up with several key saves, and Sammy Cirino danced her way past the LCC keeper for a score that sent the session into sudden death. Both Gabi Jimenez and her Maverick's counterpart scored in the sixth round, but Watkins stuffed LCC 's seventh round shot. Riley Pope failed on her first shot in the seventh round, but quickly recovered the ball and got off a last-second shot past the Mav's keeper for the win. Despite dominating long stretches of the game -- including the last 15 minutes of regulation -- Torrey Pines couldn't pull off an upset of No. 1 ranked Scripps Ranch, falling 2-1 in overtime. More details to come . . .
Torrey Pines topped Vista 6-0 on Friday and logged three more wins on Saturday by sweeping undefeated through the first round of the annual Serra Tournament. The Falcons won their pool via a 2-1 win over RBV, 7-0 trouncing of Helix and 2-0 victory over La Jolla. More details to come . . .
Coming off their huge win over No. 1 ranked Serra on Wednesday, the Falcons sputtered to a closer than expected 2-1 win over Fallbrook on Friday afternoon in the far reaches of North County. Torrey's goals came off a short corner shot by senior midfielder Gabi Jimenez and a pass from senior middy Meaghan Donnelly to sophomore forward Ryan Poe during a scramble in front of the Warriors cage. The Falcons once again dominated time of possession and the stat sheet, but had a tough time scoring against the Fallbrook defense. Up next for the Falcons -- a solo game against Vista on Friday in Falcons Stadium and then the first round of the Serra Tournament vs RBV (10 a.m.), Helix (12 noon) and La Jolla (2 p.m.) on Saturday. Sept 19 at Serra HS in Tierrasanta. The JV Falcons beat their Fallbrook counterpats 3-0. Torrey Pines patiently built a three-goal lead and then held off a furious rally in the final four minutes to beat No. 1 ranked Serra, 3-2 on the road on Tierrasanta. Like they have in every other game this season, the Falcons started strong at both ends of the field, dominating possession and keeping the Conquistadors' dangerous shooters in check. They finally hit paydirt nine minutes into the game when Gabi Jimenez pounded home a rebound off her own shot on Torrey's first penalty corner. They added to the lead right before intermission on a play that started with a Shannon Yogerst pass from the top of the circle to Ryan Poe, who dished out to Meaghan Donnelly streaking in from the right side. Donnelly's rocket shot made it 2-0 Torrey going into the lockerroom. Serra had several chances to crawl back into the game early in the second half, but each time they came up short thanks to brilliant defense on the part of the Falcons back line of Riley Pope, Farah Farjood and Brynn Froehlich and a couple of great saves by Torrey keeper Jaden Watkins. Ten minutes into the half, the Falcons stretched the lead to 3-0 on another awesome penalty corner, a combination of passes from Jimenez to Farjood to Sammy Cirino for the score. The Qs finally found the back of the cage with four minutes left to play. Another quick score and suddenly it was a close game. Serra fought for one final short corner in the closing seconds. But with everyone back, Coach JJ Javelet's team was able to keep the ball out of the circle and put the finishing touches on one of their biggest wins in recent years. Game notes: Torrey finished the game with 11 shots on goal versus 9 for Serra, and 9 penalty corners against 10 for the home team. Both goalies recorded 9 saves . . . the last time the Falcons beat the Qs was on grass at the Serra Tournament two years ago (2013) via a penalty shootout in which current captains Jimenez, Farjood and Yogerst all made their strokes . . . the Torrey upset snapped a Serra regular season home win streak that stretched back almost three years -- last time the Qs lost on their own turf was November of 2012 . . . the Falcons travel all the way up to Fallbrook on Friday for an afternoon doubleheader against the always tough Warriors and UC Davis-bound senior midfielder Tatiana Arias. The younger Falcons had a tough time with Serra's more experienced JV players and wound up losing 5-0. Sophomores Ryan Poe and Sophia LeRose scored their first varsity goals and Rylie Pope added a penalty stroke as Torrey Pines downed Del Norte 3-0 in the 2015 season opener for both teams. The Falcons dominated play from the start, firing off 13 shots on goal in the first half to none for the visiting Nighthawls. Yet the game was scoreless at halftime thanks to the heroics of Del Norte keeper Sammy Burke who turned away everthing Torrey Pines fired her way. But the Falcons broke the game open right after intermission. LeRose's goal, off a pinpoint pass to the right side by Gabi Jimenez, came just a minute into the second half. Seven minutes later, after a Del Norte defender prevented a Torrey shot from going into the goal by blocking it with her body, Pope converted on a penalty to give the home team a 2-0 advantage. Halfway through the second period, Shannon Yogerst took a long corner insert from Meaghan Donnelly down the endline and dished to Poe, who deflected into the cage for a 3-0 lead. Del Norte threatened late, but their only good scoring chance was a breakaway that Jaden Watkins thwarted with a spectacular foot save. The stats were even more lopsided than the scoreline. Torrey got off 32 shots on goal to just six for Del Norte; the Falcons earned 21 short corners versus only four for the visitors; Watkins finished with six saves compared to 29 for Burke. In JV action, Skylar Sage scored the game's only goal as the Falcons beat the Nighthawks 1-0. On a blistering hot day (94 degrees) in Carmel Valley, Torrey Pines downed Cathedral 3-0 behind two solo goals from Gabi Jimenez and another tip in by Sammy Cirinio, this time off a designed short corner pass from Gabi Le Rose. For the second straight scrimmage, the Falcons diminated the stats sheet, chalking up 15 shots on goal to only onw by the Dons and 11 short corners compared to just two by the home team. Cathedral's keeper blocked 11 Torrey shots. Shannon Yogerst scored a solo goal and Sammy Cirino tipped in a Gabi LeRose shot as Torrey Pines topped San Pasqual 2-1 in a full-game scrimmage at Falcons Stadium. The score didn't reflect how much the Falcons dominated the game. Torrey had 17 shots on goal to just one for the Eagles, and earned seven short corners versus just one for San Pasqual. The Eagles keeper kept the score down by blocking 15 Torrey shots. Torrey Pines Varsity kicked off the 2015 season with four, 25-minute scrimmages against other teams from around North County. For the second straight year, Torrey Pines fell just short in winning the CIF Division One Championship, losing to Scripps Ranch 2-1 on Saturday afternoon at Otay Ranch High School in Chula Vista. The Falcons mustered a riveting comeback in the second half during which they dominated long periods of play, but the rally couldn't overcome two Scripps goals before intermission. More details to come . . .
Gabi Jimenez scored off a penalty corner midway through the second half and the Falcons put together one of their best all-around team performances of the season as Torrey Pines beat Rancho Buena Vista 1-0 on Thursday night to advance to the CIF championship game. Torrey will once again play Scripps Ranch for the San Diego Division One title, with the game slated to start at 3 PM on Saturday afternoon at Otay Ranch High School in Chula Vista. Even more extraordinary than their performance on the field was the mental hill that all of the Falcons had to climb to get themselves into a frame of mind to even play a game on Thursday afternoon. After an anonymous internet threat, Torrey Pines High School was locked down for four hours on Thursday while police went classroom to classroom and anxious parents waited outside the school. All after-school activities on campus were cancelled and Falcons head coach J.J. Javelet scrambled to find an alternative field to host the CIF semifinal. San Dieguito Academy in Encinitas offered their brand-new turf field and the Falcons found themselves headed for a road game instead of hosting the Longhorns at home. Having already beat RBV twice this season, there was also speculation that Torrey might not be fired up enough to beat an excellent Longhorns team a third straight time. And it was RBV that looked the mire inspired squad in the early going, threatening on a flurry of fast breaks into the Falcon zone. Jaden Watkins shut down two of those attacks with superb goalie saves, Farah Farjood snuffed out another, while Gabi Le Rose did an excellent job of turning away several Longhorn attacks up the right side. It's not like the Falcons didn't have their chances in the first half. Jimenez, Alayna Tomlinson, Sammmy Cirino and Shannon Yogerst got off shots against the RBV cage, but other than a Jimenez rocket on Torrey's first penalty corner, none of the other shots required a goalie save. It seemed like only a matter of time before Torrey took the lead, and indeed it was. Earning their fifth corner of the game with less than 13 minutes to play, Rylie Pope inserted to Tomlinson who made a perfect stop at the top of the circle. Jimenez moved to to pass, hesitated as the Longhorns defense shifted in front of her, and then got off a rocket shot that sailed past the RBV keeper and into the cage for a 1-0 lead. Rather than pull back and protect the lead, the Falcons continued to attack, a momentum shift that saw Torrey completely dominate the last dozen minutes of the game. Yogerst nearly scored on a shot off the goalie's pads and another that hit the outside of the right post. The Longhorn goalie saved to other Jimenez blasts. And Young got off two late shots of her own, one that sailed just over the crossbar and another one thwarted by a keeper save. Game Notes: Torrey earned 10 short corners to just 3 for the Longhorns . . . the FAlcons had 13 shots on goal compared to 5 for RBV . . . Jaden Watkins made 4 stops in goal versus 7 for the Longhorns keeper . . . the victory was the 14th straight for the Falcons, longest win streak in San Diego County this season. Sammy Cirino and Shannon Yogerst scored in the first half, Gabi Jimenez added an insurance goal after intermission, and the Falcon defense held on for dear life at the end of the game as Torrey Pines beat Fallbrook 3-2 on Tuesday night. The victory advances the Falcons to the CIF semifinals on Thursday evening against RBV at 5:30 PM. The Falcons were on fire in the early going, earning a flurry of seven penalty corners in the first 15 minutes. Jimenez nearly scored on a reserve chip and Clare Young just missed with another hard shot, before Cirino put the home team ahead 1-0 with just under 14 minutes to play in the first half. But rather than roll over, the Warriors stormed right back, earning their own series of corners that finally paid off with 8:46 remaining until intermission when Fallbrook tied the score on a tip-in. Torrey regained the lead just before half when Yogerst blasted a rebound off her own shot into the back of the Warriors cage. The action after halftime was fast and furious, both teams charging up and down the field as Fallbrook strived to get back into the game and the Falcons struggled to extend their lead. Most of the battle was in the midfield with few scoring chances for either team until Torrey earned its 11th penalty corner of the game with around seven minutes to play. After the insert, Young flicked a short pass to Jimenez who got off a rocket shot into the cage, a goal that made it 3-1. But Fallbrook quickly counterattacked, scoring their second goal only a minute later on rebound off a shot that hit the left post. The last two minutes were a nail-biter, the Warriors continuing attacking into the Torrey zone in a last-ditch bid to send the game into overtime. They had one last corner as time expired but couldn't manage a shot before the ball was cleared. Game Notes: Torrey had 15 shots on goal versus seven for Fallbrook . . . the Falcons earned 11 penalty corners while the Warriors had 7 . . . Jaden Watkins had four saves in goal for Torrey, compared to 11 saves for the Fallbrook keeper. 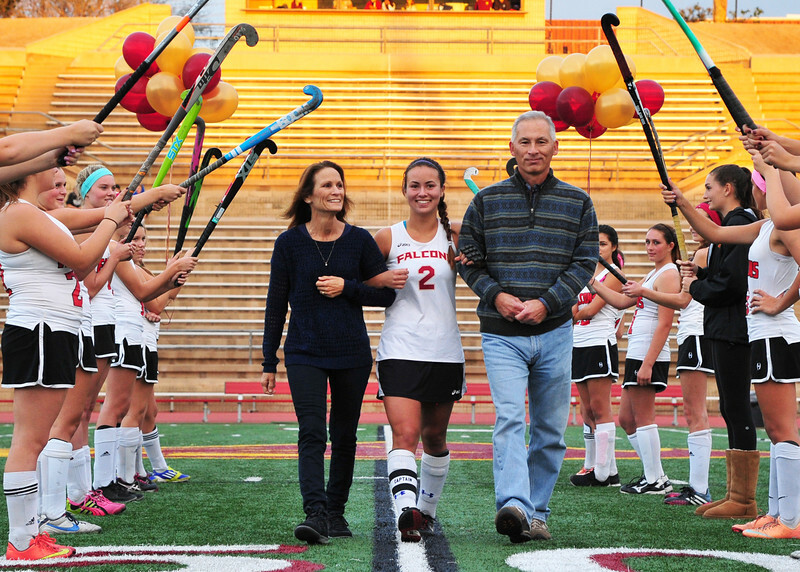 Sammy Cirino notched a pair of goals and senior Alayna Tomlinson scored on senior night as Torrey Pines downed Westview 3-0 to win its second straight Palomar League championship. Coach JJ Javelet's Falcons finished with a perfect 10-0 record and earned a bye in the first round of the CIF playoffs which start this Saturday. Playing one of their best all-around games of the season, the Falcons overcame a 20-save performance by Westview keeper Chelsea Bigelow to notch their 12th straight victory. Torrey Pines has not lost since the semifinal game of the Serra Tournament in late September. The Falcons semifinal appoint will be determined on Saturday when eight teams take the field for the CIF first round. Given the current Division One Power Rankings, there is a very good chance that Torrey Pines and Westview could meet again in the quarterfinals next Tuesday, a game that will be played at Falcons Stadium. Westview came into the game determined to grab a share of the league title, and during the open stages of the first half the Wolverines played like a team on fire, threatening to score on several attacks into the Torrey zone. But it was the Falcons who drew first blood, scoring on a short corner seven minutes into the game. Gabi Jimenez got off a rocket shot from the top of the circle that bounced around like a pinball in front of the cage with both Farah Farjood and then Cirino getting their stick on the ball. The visitors came charging back and would have tied the score just minutes later if not for a spectacular defense save by Rylie Pope, who cleared a slow-rolling ball just as it was about to cross the goal line into the Falcons cage. Cirino notched her second goal with 12 minutes to play in the half, as she deflected another hard shot from Jimenez into the upper left hand corner of the Westview cage. That seemed to take the wind out of the Wolverines and they were never the same again. Clare Young hit the post on another Torrey attack before the end of the half. The only goal of the second half came on a pass from Shannon Yogerst to Tomlinson with about 15 minutes to play. The JV Falcons (8-0-2) also won the league title thanks to a 1-1 tie with the Wolverines that left them half a game ahead of Canyon Crest (8-1-1) in the younger circuit. Game Notes: Torrye Pines logged 20 shots on goal compared to 10 for the Wolverines . . . Clare Young (with seven shots on goal), Gabi Jimenez (4 SOG) and Shannon Yogerst (4 SOG) kept the Westview goalie on her toes all night . . . the Falcons earned 16 penalty corneres to just 6 for the Wolverines . . . TP keeper Jaden Watkins registered 6 saves. Farah Farjood scored twice off short corners andflour other Falcons found the back of the cage to lead Torrey Pines to a 6-1 victory over Mt Carmel on a hot Friday aftrernoon in PQ. With the win -- their 11th straight -- the Falcons clinched at least a tie for the Palomar League championship. Farjood scored her first goal about halfway through the opening half on a pass from Clare Young. After the Sundevils fought back to tie the game, Farjood scored again early in the second half, this time on a dish from Shannon Yogerst. Rylie Pope scored out of a scrum after another Falcons short corner to make it 3-1, Gabi Jimenez extended the lead on a rocket shot from the top of the cicle, Dani Jackel scored on a long pass from Yogerst, and then Alayna Tomlinson rounded off the Torrey total on a pass from Young that just beat the final buzzer. Shannon Yogerst and Rylie Pope had two goals each as Torrey Pines downed Rancho Bernardo 9-0 under the lights at Falcons Stadium. The win keeps Torrey one game ahead of Westview in the Palomar League with two games to play. Next up: Mt Carmel on Friday, with the varsity teams slated for a 3:15 start and the JV game commencing at 4:30. The Falcons scored early and often, picking up their first goal less than two minutes into the game as Alayna Tomlinson found Yogerst in the circle. Five minutes later, Sammy Cirino dished to Tomlinson for Torrey's second goal and the rout was on. Cirino assisted on goals by Yogerst and Farah Farjood, Gia Silahian scored on a pass from Meaghan Donnelly and Cirino found the back of the cage aftern a Yogerst pass to make it 6-0 at halftime. Torrey continued the offensive avalanche early in the second half, with Pope and Donnelly scoring on solo effots before Donnelly dished to Pope for the Falcons' last goal. Game notes: Torrey Pines outshot RB 16 to 3 . . . the Falcons earned just 5 corners to zero for the visiting Broncos. The JV Falcons also beat the Broncos but we don't have the score yet. 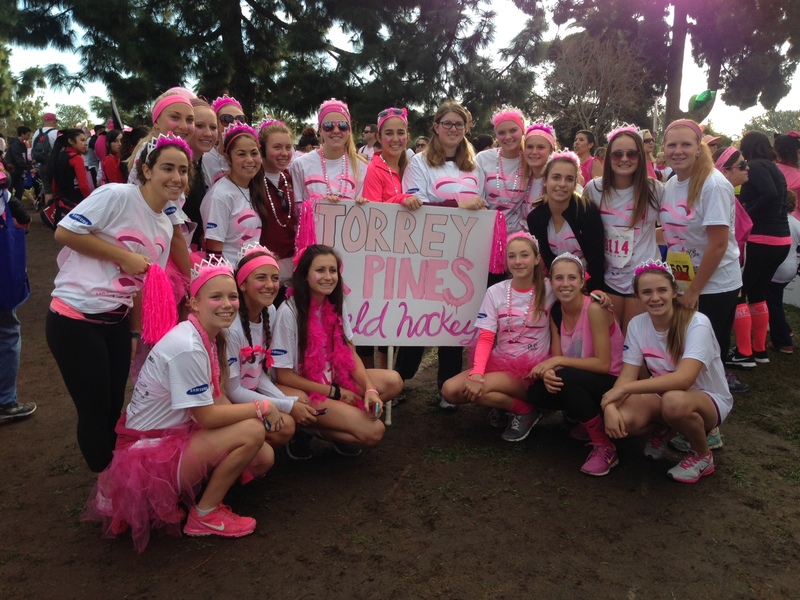 More than 35 players and family members of the Torrey Pines High School JV and varsity field hockey teams participated in the 18th Annual San Diego Susan G. Komen 5K Race for the Cure on November 2nd in Balboa Park. The Falcons field hockey teams joined 15,000 participants in the walk that raised 1.3 million dollars for the cause. Parents & Players -- If you have any other field hockey related stories or news items about Torrery Pines players or coaches please let us know! Alayna Tomlinson and birthday girl Sammy Cirino scored two goals each to lead Torrey Pines to a 5-0 win over Poway on Thursday afternoon at Falcons Stadium. Shannon Yogerst chalked up another three assists for the home team and the Falcons scored what could be the quickest goal in team history. That lightning score came just 17 seconds into the game as Yogerst dribbled the ball through three Titan defenders and then dished off to Tomlinson in front of the Poway cage. Just 77 seconds later, Tomlinson struck again, this time on a pass from Meaghan Donnelly. The Falcons made it 3-0 less than four minutes into the game when Sammy Cirino scored off a rocket pass from Gabi Jimenez. Cirino found the back of the cage again with about seven minutes until halftime after a nifty passing exchange between Donnelly and Yogerst on the right sideline of the circle. Jaden Watkins stuffed Poway's only shot on goal early in the second half. And then Clare Young finished off the Torrey scoring on a pass from Yogerst with about 15 minutes left to play. Sophia LeRose scored twice as the Falcons JV downed the Titans 3-1. Others: Vista (I) 10-7; Del Norte (II) 10-5-1; Valley Center (II) 13-5; Mt. Carmel (II) 11-8; San Pasqual (I) 11-6-1; Bonita Vista (I) 9-4-1; La Jolla (II) 9-6; Hilltop (I) 7-6-1. Torrey Pines downed archrival Canyon Crest Academy 5-1 on Tuesday afternoon, the Falcons' eighth straight victory overall and sixth straight in Palomar League play. In the second meeting of the "angry birds" this season, the Falcons proved a lot more hawkish than the Ravens, especially in the second half when they dominated the black birds at just about every aspect of the game. The win keeps Torrey one game ahead of Westview at the top of the league standings. The Ravens came out smoking, taking a 1-0 lead at the 15:40 mark on a tip-in off their third short corner. Torrey hadn't even advanced the ball into the CCA circle by that point and it was starting to look like it might be a long night for the home team. But unlike the last time these two teams played, the Falcons didn't panic. Once again combining stingy defense and a superb passing attack, they slowly but surely snatched the momentum away from the Ravens. Dani Jackel tied things up on a goal out of a scrum in front of the CCA cage -- and a short pass from Gabi Jimenez -- with 12 minutes left in the first half. Three minutes later, Shannon Yogerst sent a pass across the circle to a wide open Alayna Tomlinson on the left post, who slammed the ball home for what would turn out to be the winning goal. Canyon Crest attacked early in the second half, but their only good shot was turned away by a Jaden Watkins kick save. And the momentum turned again. Dominating the midfield and attacking with increasing confidence, the Falcons earned six short corners over a span of eight minutes in the middle of the second half. Farah Farjood scored on a dish from Clare Young on the last of those, upping the Torrey lead to 3-1. A few minutes later, Jackel snagged her second goal of the game on another feed from Young. Sammy Cirino finished off the Falcons scoring with around seven minutes to play on a blast off another cross-circle pass from Yogerst. Game Notes: Torrey Pines earned 13 short corners to just four for Canyon Crest . . . the Falcons defense held the Ravens to just two shots on goal . . . Watkins made two saves in the Torrey cage . . . the win was Torrey's third straight over CCA stretching back to last season . . . the four-goal margin of victory was the largest ever in the heated rivalry between the two Carmel Valley teams. The JV Falcons beat CCA 1-0 to take over sole possession of first place in the younger Palomar circuit. More details to come . . .
Torrey Pines played its best all-around hockey of the season on Thursday night, excelling on both attack and defense in a 3-1 win over Westview in a battle of Palomar League unbeatens. Both teams were 4-0 going into the showdown. But the No. 2 Falcons used pinpoint passing and stingy defense to down the No. 6 Wolvernies. The Falcons got on the board about midway through the first half on a short corner that involved a given-and-go from inserter Rylie Pope to Claire Young at the top of the arc, who then sent a nifty pass back to Pope for the score. Despite three more corners over the next few minutes, Torrey couldn't add to the lead. And momentum suddenly shifted to the Wolverines, who dominated the last five minutes of the half. Their best chance to score came on a fast break that slipped behind the Falcons defense, the attacker one-on-one against Jaden Watkins. But luckily her shot sailed wide. Torrey's offense kicked into gear again after intermission, a series of attacks that produced the Falcons' most outstanding goal of the season so far. The sequence started with Shannon Yogerst bringing the ball up the right side and passing right between two Westview players to Gabi Jimenez in the middle of the field. Jimenez flicked a quick pass to Gia Silahian who dished to Alayna Tomlinson charging in from the right side for a score that made it 2-0. Jimenez scored two minutes later on a rocket shot from the top of the arc on a short corner pass from Tomlinson. A disputed foul gave the Wolverines a short corner -- and their only goal of the game -- with around 10 minutes to play. But Torrey buckled down on defense, played some nice keep-away, and Westview was never able to mount another serious threat. Although it was an excellent team effort, maybe the best of the season, several Falcons earned particular praise for their play versus Westview. Brynn Froehlich shut down the Wolverines' leading scorer, especially on fast breaks up the left side. Meaghan Donnelly did an awesome job of drawing short corners. While Shannon Yogerst showed everyone how to thread the needle on passes. The JV Falcons defeated Westview 3-0 in the warm-up game. Ryan Poe scored on a pass from Skylar Sage, Olivia Emri knocked in an unassisted goal, and Sophia LeRose dished to Marisa Mitchell for the final Torrey score. Five different Falcons scored and the defense held the Sundevils to a single shot on goal as Torrey Pines beat visiting Mt Carmel 6-0 in an afternoon game at Falcons Stadium. Torrey's sixth straight win kept the Falcons tied with Westview atop the Palomar League. Attacking from the opening whistle, the Falcons got off a flury of shots in the first ten minutes, including several good chances by Gabi Jimenez and Shannon Yogerst. Torrey took the lead about midway through the first half on an excellent dish from Clare Young to Jimenez. Eighty seconds later, Alayna Tomlinson scored off a Jimenez pass to make it 2-0. Sammy Cirino finished off the Falcons' first half scoring with a goal off yet another Jimenez assist. Less than two minutes into the second half, Torrey upped the margin to four as Yogerst blasted a pass across the circle to Young, who deflected the ball to Cirino for the score. Fifty seconds later, Yogerst found the back of the cage, with Tomlinson getting the assist. Jaden Watkins made Torrey's only save of the game with 20 minutes to play. Young then rounded off the Falcons scoring with an unassisted goal at the 15:13 mark. The JV Falcons beat the little Sundevils 3-0 in the opener. More details to come . . . Working the pass and shoot to perfection, Clare Young and Shannon Yogerst combined for three goals in the first 10 minutes and the Falcons ran up an 8-0 halftime lead on their way to a resounding win over Rancho Bernardo on the road in RB. Young's hat-trick was the first of the season for the Falcons. The senior midfielder also had two assists. Her eight total points was a personal best and the most by a Torrey player in a single game this season. Yogerst's three assists in one game was also a personal best and team season high. Gabi Jimenez and Lucy Clark also chipped in two goals, while Rylie Pope, Farah Farjood and Alayna Tomlinson scored one each, as the Falcons equaled its biggest offensive output of 2014. Pope's goal -- her first as a varsity Falcon -- came on a rebound of her own shot off the RB keeper's pads. Tomlinson scored on a penalty stroke early in the first half after the Bronco keeper took her out in the box. Jimenez and Valerie Arnett also recorded assists. Torrey keepers Jaden Watkins and Gia Silahian (making her debut in varsity cage) shared the win and shutout. The Broncos only shot on goal -- and Watkins' only save -- came around halfway through the first half. Silahian did not face a single shot on goal as the Torrey defensely completely stifled Rancho Bernardo in the second half. The victory kept the Falcons in a first place tie with Westview atop the Palomar League and second place in the CIF Division One Power Rankings behind Scripps Ranch. The JV Falcons beat the Broncos 7-0 in the warm-up game. Juniors Gia Silahian, Dani Jackel, Farah Farjood and Shannon Yogerst all found the back of the cage as Torrey Pines beat Poway 4-0 on Tuesday night under the lights at Titans Stadium. In one of their more dominating performances of the season, the Falcons allowed the home team only one corner and a single shot on goal. Poway barely got the ball out of its own zone in the second half. The victory kept Torrey Pines in a two-way tie with Westview at the top of the Palomar League standings. The JV Falcons also downed Poway. 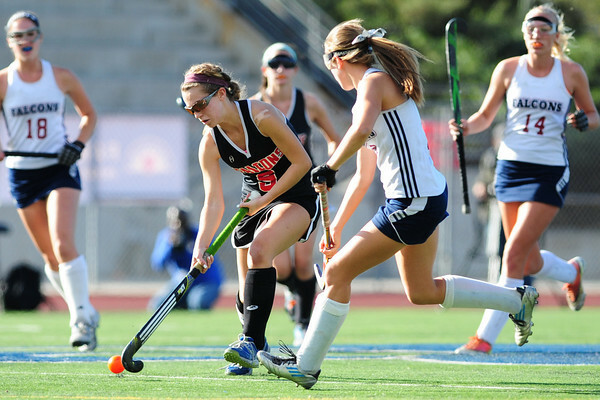 More than 37 Falcons have gone on to play field hockey at the college level including some of the top NCAA programs in the country at both the Division One and Division Three levels. Torrey alums having been making headlines around the nation this year including . . .
Grace Trupe (TP 2014) recorded her first win in the cage for Western New England University and was named Commonwelath Coast Conference Defensive Player of the Week -- Grace Trupe. Stephanie Sabraw (TP 2011) scored in her last hime appearance for the Aggies as UC Davis beat University of Pacific 2-1 -- Stephanie Sabraw. On the other side of the field, both Molly and Hannah Bettencourt (TP 2012) played for the Tigers. Heather Schlesier (TP 2011)made seven saves in goal as Yale shutout Bryant 1-0 -- Heather Schlesier. Caitlin Mackey (TP 2011) scored the winning goal for MIT in a 4-0 victory over Clark as the Engineers ran their season record to nine wins and only one loss -- Caitlin Mackey. Kristen Buchanan (TP 2013) played all 70 minutes and got off a shot on goal as Ohio University upset Ohio State -- Kristen Buchanan. Alie Zimmer (TP 2014) earned conference Rookie of the Week honors and is currently the fourth leading scorer for the Cal Bears -- Alie Zimmer. Brittany Norfleet, who played for the Falcons as a freshman and sophomore, scored her fifth goal of the season for Tufts in a 3-2 win over Hamilton. Norfleet is also co-captain of the Jumbos -- Brittany Norfleet. Farah Farjood scored twice in regulation and her teammates scoarched the Ravens in the overtime shoot out as Torrey Pines downed archival Canyon Crest 3-2 in the Palomar League opener for both teams. The game unfolded as a huge contrast in field hockey styles, Torrey's patient passing game versus CCA's "run and gun" fast-break attack. Much of the match was played in the Ravens' half of the field, and Torrey racked up 24 short corners to just six for CCA. But the Ravens took full advantage of the attacks into Falcons territory. Torrey started the game on fire, forging a quick 2-0 lead and the feeling amongst the crowd that the match could turn into a rout. Their first time down the field, the Falcons earned a short corner. Taking the insert, Gabi Jimenez blooped a short pass to Shannon Yogerst, who flicked the ball across the circle to Farah Farjood, who slammed the ball into the CCA cage. Minutes later -- on a quick counter attack that started with a Brynn Froehlich defensive stop -- Sammy Cirino dished to Alayna Tomlinson for another score. The Ravens closed the margin around halfway throught he first half on their first short corner (and first shot) of the game, a rocket that deflected off a defensive stick into the upper left-hand corner of the Torrey cage. But the Falcons kept up the offensive pressure, stretching their lead to 3-1 when Farjood scored off another corner with less than a minute left to intermission. The Falcons had their chances in the second half -- nine short corners and dominant time of possession -- but couldn't find a way to put more points on the board. Meanwhile, CCA was staging a dramatic comeback, two fast-break goals in a five minute span, to draw even with the visitors and force overtime. Jimenez, Farjood, Tomlinson, Yogerst, Rylie Pope, Meaghan Donnelly and Clare Young played in OT for Torrey, with Jaden Watkins in goal. And once again the Falcons had their chances to win the game: three more short corners, three hard shots on goal and a stretch of two minutes when the Ravens were a player down after a green card. For the third time in the last six games, the Falcons found themselves in a nail-biting shoot off to determine the winner. And they put that experience to good use, scoring on four of five attempts (Tomlinson, Jimenez, Pope, Cirino). Meanwhile, Watkins was turning away all but two of the CCA shoot out attempts. And Torrey came away with a 4-3 victory, their second in a row over a Ravens team (the defending CIF division two champs) that had dominated the series for several seasons. 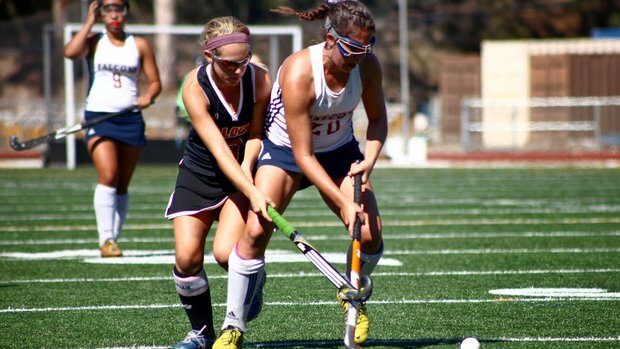 Torrey Pines junior midfielder Gabi Jimenez has been chosen for the Futures Elite Academy, the prestigious US Field Hockey Association program that channels promising young players into the national team pipeline. Jimenez is one of only five players from California (and the only one from the San Diego area) selected for this year's FEA. Overall the program includes around 150 players from across the country who will be able attend special training sessions with other Futures Elite athletes after the high school season concludes. Earlier this season, Jimenez verbally committed to play her college hockey for the Cal Bears starting in the fall of 2016. October 6, 2014 -- Torrey Pines charts right behind Scripps Ranch in the Division One power rankings released today by the CIF San Diego section. Rancho Buena Vista, Vista and Fallbrook -- three teams the Falcons have already defeated this season -- round out the top five of the first 2014 computer poll. Serra heads up the Division Two power rankings followed by LCC, Cathedral, La Jolla and Valley Center. Jaden Watkins had nine saves in goal -- including four in the crazy last two minutes -- and Sammy Cirino scored twice to lead 6th ranked Torrey Pines to a 3-2 victory over 10th ranked Rancho Buena Vista on the road in North County. Whether it was the fact they had downed RBV at the Serra tournament just six days before of the 90 degree heat, the Falcons looked less than inspired in a first half. Their intensity improved after halftime, but not by much. The Longhorn attackers continued to shred the Torrey defense until the final whistle while the Falcons attackers struggled to get the ball into the circle throughout. Reverting to early season form, Torrey earned just three short corners for the entire game and far fewer shots on goal than the Longhorns. The difference in the game was the Falcons converting what few chances they had. Torrey Pines went up 1-0 in the 13th minute when Gabi Jimenez blasted a rocket from the top of the circle. The ball hit a defender's stick and bounced over the RVB keeper's head to the left post, where an unmarked Cirino was waiting to tap it into the cafe. Four minutes later, the Longhorns tied things up on a sequence that started with their first short corner of the game. The Falcons managed to snuff the corner, but the outlet pass went straight to an RVB forward, who dished to a teammate for the score. The Longhorns took a 2-1 lead with around 40 seconds to play in the half, on a nice short corner shot from the left post that beat Watkins. It wasn't until after intermission (and a stern talking from head coach JJ Javelet) that the Falcons finally shifted from slow motion into a higher gear. Their newfound intensity paid off about 10 minutes into the half when another defensive mistake (this time by RVB) let Torrey back into the game. Desperately trying to clear the ball out of her own half under intense pressure from the Torrey attackers, an RVB defender blasted a high ball into Falcons forward Shannon Yogerst. Responding quickly to the turnover, Jimenez got off a shot from the top of the circle that Cirino tipped into the cage for a goal that tied the game at 2-2. The Longhorns had a golden opportunity to tie the game about midway through the second half on a fast break that pitted Torrey sophomore defender Brynn Froehlich against three RBV attackers. Froehlich managed to take two of the Longhorns out of the play, but the third got off a rocket shot that Watkins saved with her pads. With around 10 minutes left, Jimenez earned the Falcons third and final corner of the game. RBV's defense deflected Torrey's initial shot after the insert, but an alert Clare Young pounced on the loose ball and got off a shot that sailed past the Longhorns keeper. Finding themselves down despite dominating so much of the game, the Longhorns responded with a withering series of attacks in front of the home crowd. When Torrey went down a player on a green card with around two minutes to play, RBV threw everything they had into tying the game. But Watkins seemed to have an answer for every shot that came her way, four in total over the final 60 seconds. The Longhorns last gasp ended when Falcons defender Farah Farjood ran down and cleared the ball on RBV's final short corner. The JV Falcons also won, slipping past their Longhorn oppoents 2-1 on a late goal. More details to come . . .
On a sweltering day in Tierrasanta, Torrey Pines finished third at the annual Serra Tournament, beating Cathedral Catholic 2-1 via an overtime shoot out, losing to eventual champion and No. 1 ranked Serra 4-2 in the seminfinals, and slipping past Rancho Buena Vista 1-0 in the "bronze medal" game. The Falcons started the day with a rematch against a Cathedral Catholic team they had defeated just a few days before during regular season play. Once again, most of the play was in the Dons' half of the field, Torrey earning far more corners and shots on goal than their Carmel Valley rivals. But putting the ball in the cage -- against the tough Dons defense and even tougher Serra grass -- was a lot more problematic. Senior middy Clare Young scored Torrey's only goal on a pass from Gabi Jimenez. Cathedral tied the game on their only good scoring chance of the entire game, a counter-attacking fast break that caught the Falcons defense offguard. Junior forward Shannon Yogerst almost stole a win for Torrey in the final moment when she hit the right post on a rocket shot. But for the second time in less than 24 hours, the Falcons had to decide a game in the new shoot-out format. This time the Falcons wom the shoot out 3-2, as Young, Jimenez and Alayna Tomlinson found the back of the cage and keeper Jadin Watkins snuffed three Dons' attempts. That put the Falcons into a semifinal game versus No. 1 ranked Serra, a team that had burned them 5-0 in their season opener in early September. And it looked to be that way again as the Conquistadores wracked up five straight short corners and an early 1-0 lead. But this time the Falcons refused to crash and burn. Eleven minutes into the first half, Gabi Jimenez scored off a short corner insert from Rylie Pope to tie the game -- the first goal scored on Serra this season. The Qs continued their offensive blitz, scoring on two of their next three corners to build a two-goal cushion with eight minutes to play in the first half. But once againt the gutsy little Falcons fought back, Jimenez weaving through the middle of the Serra defense and slapping a hard shot past the Qs keeper just before intermission. Serra scored its fourth and final goal early in the second half on a nice shot from the middle of the circle. Jaden Watkins made several nice saves to keep the game close, but Torrey was unable to eject Serra from its own tournament for a third straight year. The loss relegated Torrey to a "bronze medal" consolation game against Rancho Buena Vista. Despite the low score and the mid afternoon heat, it was actually quite a fast and furious game marked by several spectacular plays. The Falcons grabbed an early lead and then held on with their best defense of the tournament. Shannon Yogerst started the scoring sequence when she intercepted an errant pass at midfield and wove around three Longhorns defenders before dishing off to Clare Young at the top of the circle. Young quickly drew a short corner, which Gabi Jimenez blasted into the cage straight off an insert from Rylie Pope. Jaden Watkins made a kick save on an RBV fast break and Brynn Froehlich made a diving stick save to keep the Longhorns off the scoreboard and give the Falcons a hard-earned win over the perennial North County powerhouse. Junior midfielder Gabi Jimenez and junior defender Rylie Pope were named to the Serra All-Tournament Team following the championship game on Saturday. Leading the Torrey attack, Jimenez scored all but one of the Falcons goals on the second day of the tournament. 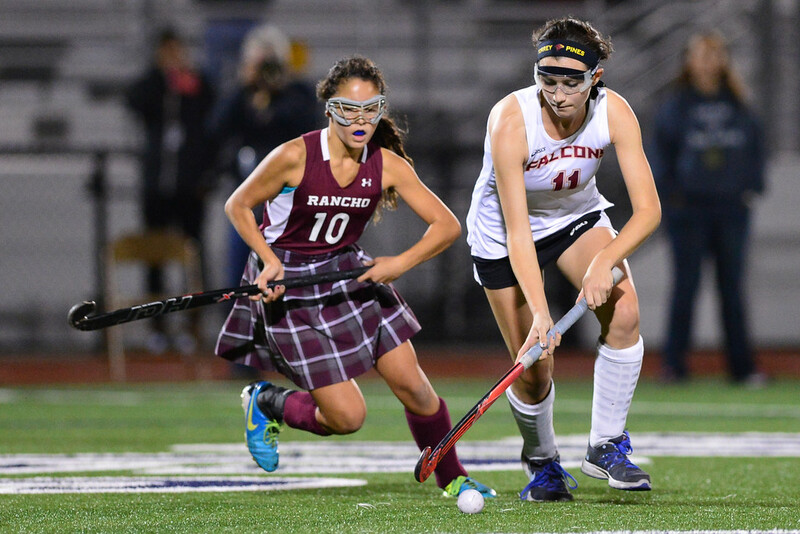 Pope had what was probably her best day ever as a Torrey field hockey player, inserting the ball well on short corners and anchoring the Falcons defense as the "last man" sweeper/stopper in the back. La Costa Canyon beat Torrey Pines in a shoot out on Friday afternoon after regulation and overtime ended in a 1-1 tie. More details to come . . .
Torrey Pines finished second in its pool on Saturday to advance to the quarterfinals of the Serra Tourney next Saturday in Tierrasanta. The Falcons kicked off the tourney with a 5-0 victory over Otay Ranch behind a Sammy Cirino hat trick and goals by Shannon Yogerst and Emily Belshin. Gabi Jimenez assisted on two of Cirino's goals and Yogerst dished the final pass on the third. Cirino returned the favor with a long pass across the circle that Yogerst knocked into the cage for the fourth Torrey score. But the game's most spectacular goal was Belshin's "safe at home" slide across the goal mouth on a pass from Dani Jackel. Torrey downed UniversityCity 3-0 in the next game, a match played at what seemed like slow-motion speed thanks to the thick grass of the upper field at Serra. The field conditions greatly favored UC, which held the Falcons to single goal in the first half (Cirino tip of a Jimenez shot on a short corner). Adjusting to the awful field, Torrey popped in three more goals after intermission. Farah Farjood scored her first goal of the season on a back door shot off a short corner. Jackel stold the ball from the UC keeper and tapped in a shot to make it 3-0. Pool winner game down to the third and final game. Scripps Ranch prevailed 2-0 in a match in which they collected 12 short corners to just three for the Falcons. Despite the loss, it was a much better performance (and closer scoreline) than the last time the two teams faced each other two weeks ago. Junior middy Gabi Jimenez scored off a short corner halfway through the first overtime period to give Torrey Pines a 1-0 victory over Cathedral Catholic on Thursday afternoon at Falcons Stadium. Despite the razor-thin final score, it was a game largely dominated by the Falcons, who earned 17 short corners to just three for the visiting Dons. The game was also proof that Torrey's attack has come along way from those first few games when they could barely earn a single short corner. They have apparently mastered that skill. The problem now is figuring out how to cash in on all those corners. Most of the Dons' scoring opportunities came during a three-minute flurry about halfway through the first half. But all were shut down, either by Torrey keeper Jaden Watkins or the stingy Falcons back line of Farah Farjood, Rylie Pope and Brynn Froehlich. Meanwhile, the Torrey offense was picking right up where it left off during the previous game, a serious of attacks deep into the Cathedral zone that produced shots on goal by Sammy Cirino, Clare Young, Gabi LeRose, Shannon Yogerst and Jimenez. A combination of great defense on the part of the Dons and awful corner execution by the Falcons kept the score even going into the half. The play was even more lopsided in the second half, as Jimenez, Young and Yogerst (falling back from forward) took control of the midfield. But the issue with the corners consisted -- 10 in the second half and not a goal to show for it. Leading into the second overtime of the young season. The starting lineup for OT this time was Farjood, Jimenez, Pope, Tomlinson, Young, Yogerst and Watkins. Cathedral had a great chance for victory on a wild breakaway ball that Watkins came way out of the cage to stuff. The Falcons quickly counterattacked, charging back into the Dons circle and earning two short corners in quick succession. The first one failed miserably again. But Torrey head coach JJ Javelet changed the play for the next attempt -- the Falcons' 17th corner of the game. Young inserted to Jimenez, who flicked a short pass to Tomlinson. Tomlinson drove right around a Dons defender and passed the ball back to a wide open Jimenez, who blasted a reverse chip past the Cathedral keeper. The JV Falcons beat Cathedral 3-0 in the warm-up game. Skylar Sage scored twice for the Falcons, the first on a pass from Olivia Emri and the second on a dish from Ryan Poe. Poe also assisted on a Sophia LeRose goal. Allison Joas earned the shutout in goal. Torrey Pines travels to Tierrasanta again this weekend for the first round of the annual Serra Tourney. The Falcons start the day with a rematch against Otay Ranch (9 AM) followed by games against University City (1 PM) and a rematch against Scripps Ranch (3 PM). We're not sure how the organizers create the pools -- whether there is some kind of seeding system for the first round or they just pull the names out of a hat. But it does seem odd that the two teams that played in last year's Serra Tourney final and the CIF division one championship game (Scripps and Torrey) should end up in the same pool. Seven different Falcons hit the back of the cage as Torrey Pines beat Otay Ranch 10-0 on Tuesday afternoon in Falcons Stadium. Gabi Jimenez had two goals and two assists, Alayna Tomlinson and Shannon Yogerst notched one goal and two assists each, while Sammy Cirino and Dani Jackel scored two goals apiece as the Torrey attack shifted into high gear against the Mustangs from the south bay. Yogerst scored what turned out to be the game winning goal early in the first half on a dish from Tomlinson. The two reversed rolls on the next Falcons score, "Tom" notching the goal on a pass from "Yoges." Yogerst then set up Jimenez for the third score as the Falcons took control of the game. Jimenez later scored off a short corner pass from Clare Young and Lucy Clark scored her first varsity goal on a dish from Meaghan Donnelly to give the Falcons a 5-0 halftime lead. Cirino tallied twice after intermission to stretch the Torrey lead to seven. Donnelly and Dani Jackel found the back of the cage later in the half to round out the Falcons' biggest offensive output of the season so far. The JV Falcons also went on a goal scoring binge, beating Otay Ranch 8-0. Emma Marks and Olivia Emri scored two goals each, whole Ryan Poe, Sophia LeRose, Michelle Buhai and Maclaine Parish tallied one each for the Falcons. Poe also contributed two assists, while Buhai and Marissa Kuberra had one assist each. In a replay of last year's Division One CIF championship, Scripps Ranch topped Torrey Pines 5-2 in a Friday afternoon game at Falcons Stadium. Dani Jackel scored the first Torrey goal on a dish from Alayna Tomlinson after a cross from Clare Young. And then Young knocked in the second Torry goal on the redirect of a long pass from Gabi Jimenez. No. 2 ranked Scripps went into the game as a heavy favorite based on earlier results this season, so the final score was certainly no surprise to those who follow hockey in San Diego. Hopefully more details to come . . .
Ryan Poe and Skylar Sage scored one each tolead the JV Falcons to a 2-0 win over Scripps Ranch in the late game. They also assisted on one another's goals. Torrey Pines scored very early and very late -- and worked hard in between -- to record a 2-1 win over Vista on the road in North County on Tuesday afternoon. With the temperature hovering around 90 degrees at game time, it was a typical Falcons-Panthers match, low scoring, back and forth, and hard fought. The Falcons scored on their first possession, not even half a minute into the game. Alayna Tomlinson took the opening ball and fired a long pass to Shannon Yogerst streaking down the right side and around the Vista defense. Yogerst's shot rebounded off the goalie's pads and right back to her stick. A little dish to a wide open Sammy Cirino on the left post and the visitors were suddenly ahead 1-0. Vista tied the game 11 minutes into the second half on a fast break up the middle after the Falcons were called for entering the circle early on their only short corner of the entire game. With the momentum now in their favor, the Panthers kept attacking. They earned three short corners over the next 10 minutes but couldn't put any of them in the back of the cage. And then it all changed in a matter of seconds. Yogerst knocked down a defensive clearance at midfield, controlled the ball and sent a long pass to Dani Jackel racing down the left sideline. Jackel took the ball into the circle and got off a backhand shot that a charging Tomlinson tipped into the Vista goal. The Falcons defense had to turn away several shots and a Panthers corner with no time left on the clock, as Rylie Pope cleared their final attempt out of the circle. Despite dominating the little Panthers, the JV Falcons could manage nothing more than a 0-0 tie in strange junior varsity game impacted by green and yellow cards on both sides. Junior midfielder Gabi Jimenez scored on a backhand chip about halfway through the first overtime period to give Torrey Pines a hard-fought 2-1 victory over Fallbrook at Falcons Stadium. The visiting Warriors dominated the first half and took a 1-0 lead into halftime on a rocket shot from the top of the circle off a short corner. But the Falcons grabbed the momentum after intermission and finally tied the game about midway through the second half on a goal by junior forward Sammy Cirino. The play started with a Shannon Yogerst running down a loose ball on the right side and a passing across the circle to Dani Jackel, who tapped a short pass to Cirino hovering near the left post. Senior forward Alayana Tomlinson nearly decided the game in regulation when she hit the right post on a shot after a breakaway up the middle of the Fallbrook defense. The Falcons had several other late scoring chances that just missed. Meaghan Donnelly, Farah Farjood, Rylie Pope, Clare Young, Jimenez and Yogerst started the 7 versus 7 overtime for Torrey, with Jaden Watkins in goal. The Falcons completely dominated OT with continuous attacks into the Fallbrook zone and a defense that wouldn't let Warriors past the 50-yard line. Jimenez finally ended the game with a blast from the left side of the circle that soared past the Fallbrook keeper. The JV Falcons beat Fallbrook 2-0 in the opening game. 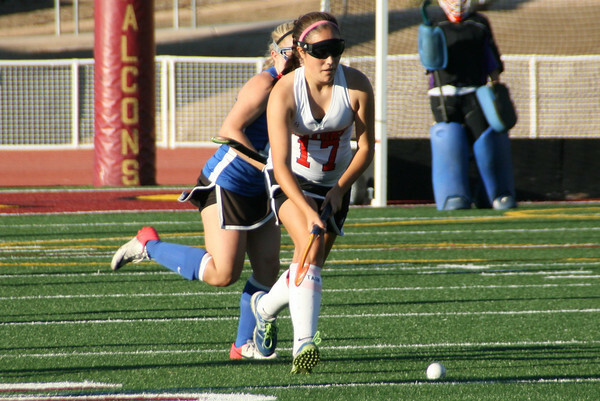 Torrey Pines started the 2014 field hockey season in rather inauspicious fashion on Tuesday afternoon with a 5-0 loss to Serra at Falcons Stadium. Despite the lopsided defeat there were two consolations for the Falcons -- just about everyone tabs Serra as the county's No. 1 team going into the new high school season, and the Falcons looked much better in the second half, attacking to the final whistle. Torrey Pines stumbled out of the starting gate, failing to collect any short corners or shots on goal in a miserable first half. The only highlight for the home team was some excellent goalkeeping by Jaden Watkins, who managed to keep Serra scoreless for the first 20 minutes. Watkins recorded eight saves overall. The Falcons finally started to get their act together in the second half, earning four corners (to just two for the Qs). Even though they couldn't push the ball past the veteran Serra defense and keeper, the forward trio of Sammy Cirino, Alayna Thomlinson and Shannon Yogerst all got off shots on goal. Serra's quick counter attacks were the major difference in the game, producing three goals on fast breaks up the middle of the Falcons defense. The JV Falcons lost 2-0 to their Serra counterparts. Torrey Pines grad Alie Zimmer scored twice -- including a golden goal in overtime -- to lead the Cal field hockey team to a 2-1 victory over Fairfield in the Bears' season opener last Friday. Playing in her first-ever collegiate game, freshman Zimmer was a force to be reckoned with in the circle, scoring on a backhanded flick in the second half and a breakaway in overtime to secure the win. 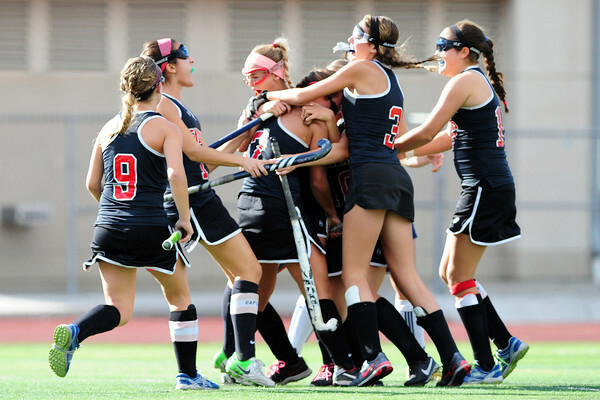 July 23, 2014 -- Tryouts for the 2014 Torrey Pines varsity and JV field hockey teams will start on Monday, August 18 and run through the following weekend. Tryouts will take place in Falcons Stadium. Times each day are . . . Note! Please bring drinking water to tryouts this week -- the athletic department may or may not supply it. Also, anyone trying out for the teams needs to bring their hockey stick, mouth guard, shin guards, goggles and running shoes. 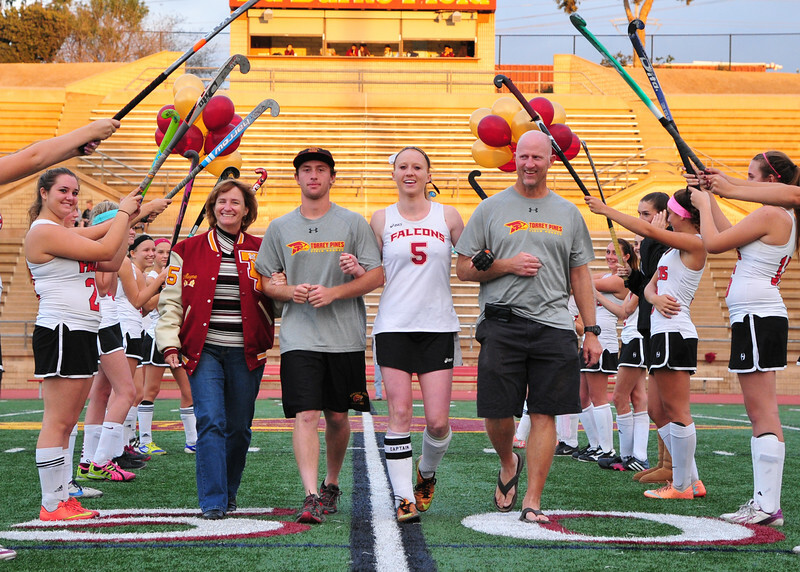 July 14, 2014 -- Falcons alum Jessica "JJ" Javelet has been named the new varsity field hockey coach at Torrey Pines High School. Javelet played for Kari DiGiulio at Torrey before a distinguished hockey career at Louisville University and the U.S. Under 21 National Team. She was an assistant coach at St Joseph's University for three years and was an assistant coach at Torrey (2008-2010) when the Falcons won their last CIF championship. Melissa Effertz has just been hired as the new junior varsity field hockey coach. Melissa graduated from the University of Massachusetts at Lowell last spring after playing four years on the Rivers Hawks NCAA division two field hockey team. A native of Oceanside, she played her high school hockey at Rancho Buena Vista. Torrey Pines put up a spirited fight but eventually fell 2-1 to defending champs Scripps Ranch in the CIF San Diego Section championship game on Saturday afternoon. At the start of the season, nobody picked either of these teams to make the final. But both of them managed to squeak out semifinal wins over superior opponents to face each other for all the marbles. The coastal Falcons and the landlocked Falcons had faced each other twice already this season, head coach Katy Moyneur's Torrey Pines team taking the first game in overtime and Scripps Ranch winning the second in strokes. And once again is was a close affair, the momentum shifting back and forth throughout the 60 minutes of play. Torrey got off to a fast start, earning two short corners in the first five minutes, neither of which resulted in goals. No doubt boosted by playng on their home field, Scripps took over after that, firing off several shots on goal that were blocked by Torrey keeper Grace Trupe and a flurry of short corners. It was on the fifth corner that they finally scored, Kelsey Dejesus dishing to fellow senior Mary Shelton for a quick flick that put Scripps up 1-0 with about 12 minutes to play until halftime. But the Falcons came right back Just three minutes later, on a short corner, Shannon Yogerst tipped in a pass from fellow sophomore Gabi Jimenez to tie the game at 1-1. Scripps fought their way to three more corners before intermission, but a foot foul, a Trupe save and a Jimenez clear thwarted all three scoring attempts. Scripps continued to pressure the Falcons defense early in the second half. But Torrey's defense held tight. Madison Cohen turned away a shot with a stick save, Farah Farjood ended another Scripps threat when she cleared the ball out of the bounds, and Trupe made another great save. Torrey nearly took the lead on a brilliant counterattack that started with Jimenez stealing the ball at midfield. She sent a long pass up the middle of the field to senior forward Mackenzie Pope in the Scripps circle. Charging out of the box, the Scripps goalie crashed into Pope, knocking the ball lose. It rolled to Yogerst near the top of the circle, who got off a rocket shot on the empty goal that looked like it was going in . . . until a Scripps defender made a lunging stick save to send it wide left. But then the momentum shifted again, Scripps driving deep into the Torrey zone. Trupe blocked two shots in quick succession, the latter leading to a Scripps long corner. Taking the corner, Dejesus sent a hard pass right across the front of the Torrey cage. The ball hit a Torrey defender in the foot, the referee raised her arm for a short corner but didn't blow the whistle, waiting see who got possession. Scripps sophomore Christie Hansen pounced on the loose ball, knocking it into the lower right-hand corner of the Falcons cage to give Scripps a 2-1 lead with around 10 minutes to play. Torrey tried its best to even the score in the closing minutes. And they had their chances. The Falcons' sixth short corner of the game was thwarted by a foot foul. With around five minutes left, Alie Zimmer intercepted a pass in the infield and dished off to Meaghan Donnelly streaking up the right side. But the Scripps defense closed in and shut her down. Inside two minutes, Torrey earned one last long corner. But Zimmer's pass into the circle was deflected out of bounds. And suddenly the season was over. The Falcons may not have won the big prize, but they went further than anyone (including themselves) would have predicted, snatching the Palomar League title from favored Canyon Crest, upsetting favored San Pasqual in the semis and clawing their way into the championship game versus Scripps Ranch. 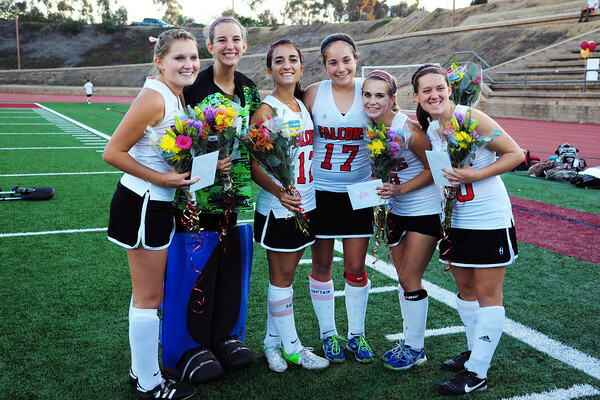 Game Notes: Falcon seniors Alie Zimmer and Argerey Stapakis were named to the San Diego All-County Field Hockey Team announced after the game . . . Stapakis also received the CIF Sportsmanship Award . . . Both Torrey Pines and Scripps Ranch started five sophomores in the championship game, setting up a rivalry that will no doubt last for years to come . . . Grace Trupe made seven saves in goal for the Falcons . . . Shannon Yogerst got off three shots on goal for the Falcons, followed by Alie Zimmer (2), Gabi Jimenez (2) and Mackenzie Pope (1) . . . Scripps Ranch had 12 short corners; Torrey Pines had seven. Meaghan Donnelly tipped in a pass from Shannon Yogerst with less than five minutes to play to give Torrey Pines a 1-0 semifinal victory over San Pasqual and a trip to the CIF San Diego Sdection field hockey championship game on Saturday. The Falcons will face defending champs Scripps Ranch, which beat Rancho Buena Vista 1-0 in the other semifinal game. Tipoff is schedule for 1 PM on Saturday in the Scripps Ranch stadium. On an afternoon that features torrential rain and intense rainbows, it was the Falcons who ended up with gold rather than the host Eagles. No. 2 seeded San Pasqual went into the match as slight favorites over third-seeded Torrey. From the opening moments the game was a contrast in two very different styles of hockey -- the big, bad Eagles against the gutsy little Falcons. One team physical, confident and blessed with excellent technical skills; the other one smaller, faster and more determined in the closing minutes. The Eagles started fast, attacking into the Torrey zone and earning three short corners in quick succession. A defensive stop thwarted the first one while Falcons keeper Grace Trupe -- playing one of her best games of the year -- knocked the other shots away. The Eagles squandered two more corners during the rain that drenched the closing minutes of the first half and the Falcons went into intermission feeling awfully lucky they weren't several goals in the hole. But often that's all it takes to turn a game around. Rather than a team that had no shots on goal and zero corners in the first half, the Falcons took the field after halftime with growing confidence. And what seemed like fresh legs. Because they began to outrun the Eagles. Alie Zimmer stole the ball at midfield and sprinted 40 yards into the Eagles zone to draw a long corner. Shannon Yogerst raced 60 yards to beat a San Pasqual defender to the ball in the back corner. Callie Petrey-Juarez took another breakaway deep into the heart of the Eagles zone before she was run down by two defenders. Suddenly San Pasqual looked vulnerable . . . and Torrey Pines the team with more raw determination. At the other end of the field, Trupe continued her goalkeepng gymnastics, making a kick save on an Eagles fast-break shot and using her pads to reject a quick flick right in front of the cage. Luck came into play too -- the Eagles inabiility to get their stick on a pass the dribbled right across the Torrey goal line. And conditioning came into play. Running out gas, the Eagles started to make mistakes, knocking shots wide right and wide left rather than on goal. And then inadvertently hitting the ball out of bonds on a pass-back to a defender. It was that last play that started the Falcons scoring drive. Taking the out-of-bounds ball around the 40 yards line, Torrey worked it up the left sideline. Mackenzie Pope battled and beat an Eagles defender for the ball in the left corner. She flicked it along the endline to Yogerst, who twirled and passed to Donnelly charging in from the top of the circle. In a spilt second Torrey Pines suddenly winning a game that by all accounts that should have been out of already. A tense five minutes of defense followed, San Pasqual furiously attacking into the Falcons circle. But with everyone back, Torrey managed to clear the ball every time and earn their most improbable victory of the season. 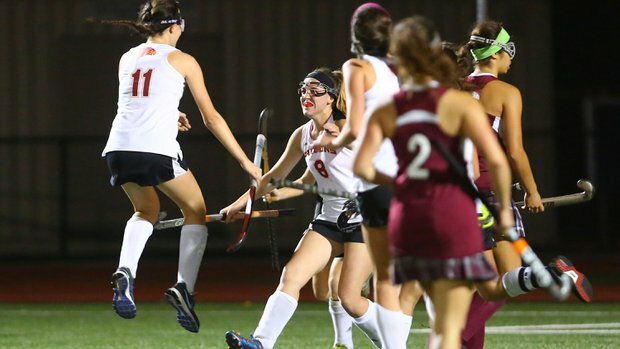 Game Notes: Torrey Pines had only two shots on goal and zero corners . . . neither team earned a short corner in the second half . . . the Falcons last appearance in the CIF championship game was 2010 when they lost to Scripps Ranch in strokes after double overtime ended in a tie . . . Torrey and Scripps split their two games this season, the Falcons take the first game 1-0 in overtime at Falcons Stadium and losing in strokes in the championship game of the Serra Tournament . . . both Torrey Pines and Scripps Ranch have teams dominated by talented seniors and upstart sophomores. Sammy Cirino scored off the rebound of a Mackenzie Pope shot with four minutes to play to give Torrey Pines a nail-biting 1-0 win over Fallbrook in a CIF quarterfinals game at Falcons Stadium on Tuesday night. The Falcons advance to a CIF semifinal game on Thursday at San Pasqual, a 3-0 winner over Westview in another Elite Eight game. The Falcons dominated much of the first half against Fallbrook, but didn't get that many good looks at the goal thanks to a stingy Warriors defense and a lack of calls inside the circle despite the very physical play. In fact, Torrey had just one short corner during the whole opening frame. 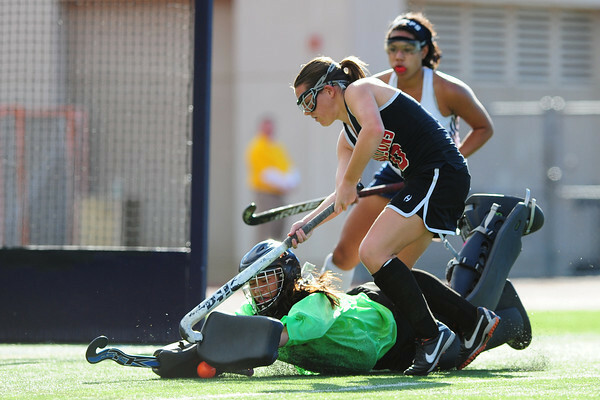 The Fallbrook keeper mananged to get her pads on hard shots by Alie Zimmer and Shannon Yogerst. At the other end of the field, Madison Cohen single handedly shut down a Warriors four-on-two fastbreak and Grace Trupe blocked the only serious Fallbrook shot of the first half. Torrey ramped up the offensive pressure after halftime, drawing a flurry of corners and gradually wearing down the Fallbrook defense. Finally getting their passing game in order, the Falcons created numerous scoring chances: Zimmer hit the left post with a rocket shot, while Cohen and Gabi Jimenez just missed on tip-ins. Meanwhile the Torrey defense -- Cohen, Argery Stapakis, Farah Farjood and Meaghan Donnelly -- was smothering the Fallbrook attack with one of their best performances of the season. All of that hard work finally paid off in the closing minutes. Mackenzie Pope got her stick on a long cross from the right side, a shot that blooped off the goalie's pads and right in front of Cirino, who slammed it into the left side of the Warriors cage. Fallbrook finally put the goal in the Falcons cage off a short corner with no time left on the clock, but the ball was too high and the goal disallowed by the ref. Torrey Pines capured the Palomar League championship outright on Wednesday afternoon with a resounding 3-0 win over Westview. How appropriate that on Senior Night all three Falcons goals were scored by seniors -- Madison Cohen, Madi Coughlin and Alie Zimmer. Another senior -- Grace Trupe -- got the win and the shutout in goal. It wasn't nearly as easy as the last time the Falcons played the Wolverines. This time it was Westview that came out smoking, nearly taking the lead in the first two minutes on a shot that hit the left post. But Torrey settled down after that and within minutes had taken the lead themselves, as Cohen knocked in the ball from a scrum in front of the Wolverine cage after a short corner. The Falcons upped the margin to two goals shortly before halftime when Coughlin tipped in a rocket shot from Zimmer at the top of the circle. The Wolverines finally broke out around midway through the second half, a flurry of attacks and at least one great shot that Trupe knocked away with a great safe. Zimmer made it 3-0 in the closing minutes on a brilliant backhand reverse. Game Notes: Torrey Pines earned 15 corners to 7 for Westview . 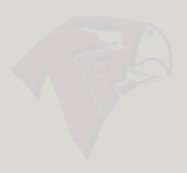 . . the Falcons last won Palomar in 2010 when the team went 10-0 in league. The JV Falcons beat the little Wolverines 2-0 to finish off an excellent Palomar League campaign. Falcons senior forward Madi Coughlin muscled in the deciding goal off a penalty corner early in the second half to give Torrey Pines a dramatic 1-0 win over Canyon Crest Academyon Friday afternoon. The result knocked the Ravens out of first place in the Palomar League and assured the Falcons at least a tie for the league title. A victory over Westview next Wednesday would give Torrey Pines the league championship out right. If the Falcons last game against the Ravens was like an Edgar Allen Poe nightmare, this game was a text book example of how to turn things around and beat an opponent that seemed to have your number. CCA had defeated Torrey Pines three straight times going into Friday's match. including a decisive 3-0 win last month. But those who attended on Friday saw a much improved Falcons team on offense and defense and vastly different outcome. The "deer in the headlights" Falcons were gone, replaced by a team determined to upset both the Ravens and those who predicted they wouldn't beat Canyon Crest again until next year when the talented Ravens seniors are long gone from high school playing fields. From the opening whistle the game was physical, fast and high energy. It was a back and forth affair, both teams deftly moving the ball up and down the field and into scoring position, only to be thwarted by tough defensive play. The stats show how evenly matched it was. Torrey Pines earned 10 short corners to CCA's nine. The Falcons had six shots on goal to five for the Ravens. Senior co-captain Alie Zimmer and sophomore forward Shannon Yogerst contributed the bulk of Torrey's scoring chances, with three and two shots on goal respectively. But it was Coughlin's only shot of the game -- off a pass from senior co-captain Madison Cohen -- that proved the difference. In the Falcons cage, senior Grace Trupe chalked up another shutout with five saves. The Falcons junior varsity also made amends for last month, tying their Ravens counterparts 0-0 in a game that was abondoned due to darkness (and a lack of lights at CCA's brand new field). Gabi Jimenez and Sam Miller scored twice each in leading Torrey Pines to an 8-0 win over Mt Carmel in a Palomar League game on Wednesday afternoon. Six different Falcons scored in an offensive blitz that saw Torrey outshoot the visitors 20 to nothing. Members of the Torrey Pines varsity and JV field hockey teams participated in the 17th annual San Diego Susan G. Komen 5K Race for the Cure on November 3rd in Balboa Park. Left to right in the photo: Kim Hansen, Farah Farjood, Alayna Tomlinson, Alie Zimmer, Gia Silahian, Shannon Yogerst, Gabrielle Enriquez, Gaby LeRose, Jaden Watkins, Brynn Froelich and Michelle Buhai. Mackenzie Pope and Meaghen Donnelly scored their first varsity goals as Torrey Pines trounced Rancho Bernardo 4-0 in a Palomar League game on the road in RB. It was another dominating performance by the Falcons, who outshot the Falcons 20-3. Sophomore forward Shannon Yogerst scored what turned out to be the winning goal with seven minutes left in the first half as she blasted a pass from Gabi Jimenez into the Bronco cage. Pope scored seven minutes into the second half and Donnelley increased the lead to three with 16 minutes left to play on another dish from Jimenez. Senior middy Alie Zimmer capped off the Torrey scoring with a late goal. Game Notes: Grace Trupe made three saves and went the distance in goal . . . Torrey Pines chalked up 14 short corners to none for RB. Madison Cohen scored on a backdoor play in overtime to give Torrey Pines a 2-1 overtime victory over a gutsy Poway team on Wednesday afternoon. After getting blasted by the Falcons in their league opener, the Titans were determined to make a better showing at home. And they did, starting with the switch of surfaces from Poway’s stadium turf to a patchy grass field at the back of the school. But the grass only proved a partial equalizer. What Poway failed to take into consideration is the fact that Torrey is undefeated on grass this season, including an upset win over No. 1 ranked Serra. The Falcons dominated the first half with repeated attacks into the Titan's circle that created multiple short corners and shots on goal. But the uneven surface and a series of great saves by the Poway keeper kept the Titans in the game. Poway capitalized on one of their rare ventures into the Falcons zone, scoring with 4:14 left until intermission to grab the lead. The Falcons pulled even with 12:13 remaining in regulation, as sophomore middy Sammy Cirino scored off a penalty corner. Cohen’s game winner in overtime also came on a short corner, as she tipped in a shot from Alie Zimmer at the top of the circle. Game notes: Torrey Pines had 18 short corners to zero for Poway and outshot the Titans 18-4. . . The Falcons high-scoring sophomores led the offensive blitz with Cirino and Shannon Yogerst contributing five shots each, and Gabi Jimenez getting off three . . . Grace Trupe made four saves to earn the victory and shutout in goal. Torrey Pines rebounded from its midweek loss with an impressive 4-0 win over Westview on Friday afternoon, a victory that propelled the Falcons into a three-way tie for the Palomar League lead with Westview and Canyon Crest. This was a completely different Falcons team to 48 hours earlier, attacking with confidence from first whistle to the last and never letting up on the pressure. Senior Madi Coughlin and sophomores Gabi Jimenez and Shannon Yogerst applied the early pressure with a battery of shots and charges into the Wolvervine circle that drew 11 short corners in the first half. It was Coughlin who netted the first goal, on a feed up the middle from Jimenez. Minutes later, soph middy Sammy Cirino extended the lead on a shot into the upper left-hand corner of the cage off a pass from senior co-captain Alie Zimmer. Torrey made it 3-0 early in the second half, as Zimmer slammed the ball into the Westview cage on the Falcons' 12th corner of the game. The final Torrey score came on a fast break with about 10 minutes to play as Cirino pushed a perfect pass to frosh forward Callie Petrey-Juarez wide open in front of the Wolverine cage. Westview made a late push, but a couple of blocks by senior keeper Grace Trupe and a terrific defensive save by soph defender Rylie Pope preserved another shutout for the Falcons. Kudos also to senior co-captain Madison Cohen, and soph defenders Farah Farjood and Meaghan Donnelly for holding the high-powered Wolverine offense scoreless during this critical league game. The JV Falcons also rebounded from their only league loss with a hard-fought 1-0 victory over the junior Wolverines. No. 7 ranked Canyon Crest Academy, the CIF Division II runner-up the past two seasons, defeated No. 4 ranked Torrey Pines 3-0 on Wednesday afternoon in a Palomar League showdown at Falcons Stadium. The result means the Ravens and Falcons are now tied (with identical 3-1 records) for second place in the league. Torrey Pines faces first place Westview on Friday at 3:15 pm, a game that will determine if the Wolverines stay in first place or drop into a three-way tie with CCA and Torrey. The JV Falcons lost 0-2 to the JV Ravens in a showdown of the top two junior varsity teams in the Palomar League. 10, La Costa Canyon (II) 7-7. Others: La Jolla (II) 12-5-1; Bishop’s (II) 15-4-1; Valley Center (II) 8-7-2; Cathedral Catholic (II) 11-9; Hilltop (I) 10-5-1. Torrey Pines beat Mt Carmel 6-0 on Friday afternoon on the road on Rancho Penasquitos, a victory that kept the Falcons tied with Westview (and one game ahead of CCA) at the top of the Palomar League standings. In one of the best team efforts of the season, eight different Falcons collected scoring points and 12 different players got off shots as the visitors clicked into high gear against the Sundevils. The Falcons scored on their very first short corner, Argerey Stapakis passing to Madison Cohen on the back post. Goals from Dani Jackel (off a Gabi Jimenez pass) and Callie Petrey-Juarez (off another Stapakis dish) made it 3-0 Torrey at the half. Right after intermission Shannon Yogerst scored two goals in less than three minutes, both of them off excellent feeds from Alie Zimmer. Madi Coughlin finished off the Falcon scoring with a solo effort about halfway through the second frame. The JV Falcons defeated their Sundevil counterparts by the same 6-0 margin, as they also stayed a top the Palomar League junior varsity standings with three wins and zero losses. Game Notes: The Falcons outshot the Sundevils 28-0 and earned nine corners to one for the home team . . .Grace Trupe earened another shutout in goal for Torrey Pines. Torrey Pines beat Rancho Bernardo 3-0 on Wednesday afternoon on goals by Alie Zimmer (2) and Shannon Yogerst and another dominating defensive performance. The win kept the Falcons undefeated in league play and tied with Westview at the top of the Palomar League table. Torrey outshot the visiting Broncos 25-3 and and earned 17 corners to just 3 for RB. The Falcons scored on their very first corner, Zimmer slamming the ball into the cage on an insert from Madison Cohen less than two minutes into the game. Zimmer scored again 83 seconds later on a solo effort up the middle of the RB circle. Yogerst made it three-nothing with around eight minutes left in the first half as she slanted the rebound of a Gabi Jimenez shot into the upper left-hand corner of the Bronco cage. Torrey had 10 short corners in the second half but failed to extend the margin. Rancho Bernardo didn't get anything going on offense until the final minutes when they got off three shots against Falcons keeper Grace Trupe, who earned the shutout. The JV Falcons bested the Broncos 6-0. Game Notes: In other Palomar League games yesterday, CCA beat Poway 3-0 and Westview slipped past Mt Carmel 1-0 . . . The Falcons take on Mt Carmel tomorrow (Friday) on the road in PQ. Torrey Pines has moved up one place (to No. 4) in the latest San Diego CIF Section field hockey rankings -- thanks to Vista's overtime victory over Fallbrook last week. The biggest mover of the week is Westview, which soared to No. 6 on the strength of the Wolverines' upset win at Canyon Crest on Friday. Three of the top eight teams are now from the Palomar League. 10, La Costa Canyon (II) 7-6. Others: La Jolla (II) 10-5-1; Cathedral Catholic (II) 10-8; Bishop’s (II) 8-4-1; Valley Center (II) 7-6-2; Hilltop (I) 9-5-1. Torey Pines kicked off its 2013 Palomar League season in fine form on Friday afternoon with a 5-1 over visiting Poway. The Falcons outshot the Titans 23 to 2 and earned 14 corners to just 2 as the Torrey offense kicked into high gear for the second time this week. Shannon Yogerst opened the scoring in the 13th minute on a dish from Gabi Jimenez. Poway's keeper thwarted a number of other Torrey shots and the Falcons went into intermission with a slim one goal lead. But like they have so many times this season, the Falcons shifted into warp speed in the second half. Madi Coughlin made it 2-0 on a fast break pass from Yogerst. The Titans struck back, snatching a goal on a deflection off the foot of a Falcons defender that blooped up and over Grace Trupe's outstretched arms. That gave Poway a huge momentum boost. But Torrey quickly snuffed out the threat when Yogerst threaded a pass up the middle of the Titan defense to Alie Zimmer for the third Falcons score. Sammy Cirino expanded the margin to three goals on a beautful pass by Clare Young across the Poway goalmouth. Zimmer finished off the scoring when she slammed in a rebound off a Titan defender's foot with just minutes remaining till the final whistle. The JV Falcons also won their league opener, 1-0 over the Titans. On a very rainy afternoon at Falcons Stadium, Torrey Pines beat Del Norte 7-0. Madison Cohen scored on a short corner in the first minute and that opened the floodgates for one of the Falcons best offensive shows of the season so far. Madi Coughlin popped in two goals while Sammy Cirino, Dani Jackel and Alie Zimmer notched one each. Freshman forward Callie Petrey-Juarez scored the first goal of her varsity career when she tipped in a shot by sophomore Gaby LeRose (who collected her first varsity assist) to finish off Torrey scoring in the second half. Zimmer had two assists, Gabi Jiminez and Shannon Yogerst one each. Grace Trupe and Katie Gitre shared the shutout in goal, with Trupe saving the only Del Norte shot of the entire game. The Falcoms outshot the Nighthawks 18-4 and earned 13 corners versus five for the visitors from 4S Ranch. The JV Falcons also won, besting the Nighthawks 2-0. 10, La Jolla (II) 10-4-1. Others: Cathedral Catholic (II) 9-8; La Costa Canyon (II) 4-6; Bishop’s (II) 10-5; Point Loma (II) 5-4; Valley Center (II) 6-5-2; Poway (I) 8-7; Hilltop (I) 7-4-1. It was a strange game on a strange night that was once again decided not so much on what happened on the field of play but rather what the referees decided (or did not decide). At the end of play, No. 5 ranked Rancho Buena Vista had defeated No. 2 ranked Torrey Pines in strokes after regulation and overtime ended in a 1-1 tie. But it was so much more than that. Depleated by illness and injury, Torrey went into the game without one of its top defenders and two of its leading scorers. Many were expected the Longhorns to stamped past the undermanned Falcons. But the game didn't play out the way. Showing more grit than maybe they have all season, the Falcons attacked over and over again. They dominated time of possession, hade far more shots on goal and earned 14 short corners to just two for visiting RBV. But as it has in several other crucial games this season, the ultimate outcome came down to referee conferences at the top of the circle to discuss and decide the previous play. The first controversial play came around 13 minutes into the first half when a Longhorn defender cleared the ball out of the RBV zone with a shoulder-high ball that sailed through a group of players.The Falcons came to a screeching halt, figuring it was an obvious highball call. But there was no whisle. The ball ended up around midfield, where an RBV forward scooped it up, juked around the last Torrey defender and got off a shot that beat Falcons keeper Grace Trupe. The ball was bottled up at the RBV end of the field for most of the second half. The Falcons finally tied the game on a pass from Alie Zimmer to Sammy Cirino with 6:52 to play in regulation. Torrey Pines also dominated overtime, earning six short corners to none for the Longhorns. On the first these the RBV keeper appeared to trap the ball beneath her body. Torrey was award another corner, but no penalty stroke. On the follow-up corner, Torrey middy Gaby Jimenez got off a shot that appeared to be the RBV keeper. The video show Longhorn goalie half inside the cage, her head turned backwards as she looks at what is presumably the ball. The Falcons jumped into the air in celebration of what they thought was a golden goal victory. But by the time the refs were in place to see what was happening, the RBV goal has pulled the ball back across the line. Can't blame her -- she was doing what it takes to win (or rather not lose) in this case. The refs conferred at the top of the circle again. And once again the call went against Torrey. No goal. The Falcons went into the strokes session emotionally deflated and physically spent. RBV put four strokes into the cage, to just one (Farah Farjood) for Torrey Pines. And the Falcons were left with another bitter defeat that was decided not so much on how they played but referee interpretations of what happened on the field. Torrey has been impacted both ways this season -- both winning and losing games decided by controversial calls. Winning games in which they clearly did not domnate and losing games they clearly domnated. So maybe last night was a case of what goes around, comes around. But it would be nice if more games could be decided by good field hockey rather than confabs at the top of the circle. Game Notes: Clare Young sparkled in the midfield against RVB, one of the main reasons the Falcons dominated time of possession . . . defenders Argerey Stapakis, Farah Farjood, Meaghan Donnelly and Rylie Pope did a fantastic job on the backline last night, holding the Longhorns to just two corners and only one shot on goal before strokes . . . All four Torrey defeats have come against teams ranked in the curent top six. The Falcons' record against teams ranked in the Top 10 is sevens wins against four losses. The JV Falcons put up a spirited fight but dropped their game 0-2 to the visiting Longhorns. Others: La Costa Canyon (II) 2-6; La Jolla (II) 9-3; Poway (I) 7-6; Valley Center (II) 6-4-2; Point Loma (II) 5-3; Hilltop (I) 6-4-1; Bishop’s (II) 6-4-1. 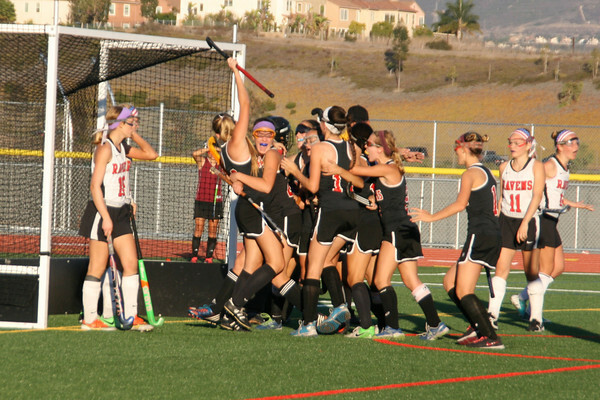 On one of the best days for Torrey Pines field hockey in years, the Falcons upset No. 1 Serra on their home field and took second in the Serra Tournament via a hard-fought strokes loss to Scripps Ranch. The Falcons started the day with a resounding 5-1 win over Vista as senior Alie Zimmer and sophomore Shannon Yogerst scored two goals each. The Panthers went on the attack early, Falcons senior keeper Grace Trupe making two great saves to keep the score tied. Torrey broke the deadlock with around 10 minutes left in the first half on a fast break that saw Madi Coughlin dish off to Zimmer for the score. Coughlin added another assist at the start of the second half, feeding Yogerst with a pass in front of the Vista cage. But Vista fought back, notching a goal of their own three minutes later off a short corner. Zimmer scored on a short corner about 15 minutes into the half and Yogerst made it 4-1 when she batted down a waist-high ball and pounded it past the Panther goalie. Sammy Cirino rounded off the Falcon scoring with yet another assist from Coughlin. Top-ranked Serra got off to an early 1-0 lead in the semifinal against Torrey, scoring on a counterattack through the middle of the Falcons defence. The Conquistadors continued to dominate through the rest of the first half, but couldn't find the back of the cage. After intermission the momentum started to shift on Torrey's favor as the Falcons earned a string of short corners and Trupe made several spectacular saves to keep the game within range. The last of those short corners paid off, a sophomore combo that found the ball moving from Gabi Jimenez to Shannon Yogerst to Sammy Cirino for the goal that tied the game at 1-1 with less than two minutes to play. In the sudden death that followed, Jimenez, Yogerst, Madison Cohen, Farah Farjood and Alie Zimmer all hit their strokes to send Torrey through to the championship game. The final against Scripps Ranch was an intense back and forth affair that saw both teams dominating at times and fading at others after three hours of intense hockey. The Falcons were much improved over their last meeting with No. 3 Scripps, when the visitors from Tierrasanta were unlucky not to come away with the win. This time around both time of possession and shots on goal were a lot more even, neither team able to muster enough energy to grab any lasting momentum. Both Falcon goalies had terrific games: Katie Gitre in the first half and Grace Trupe in the second. Both of the goals in regulation came on short corners late in the first half. Scripps took the lead wth about 13 minutes to play until intermission. The Falcons responded seven minutes later as Madison Cohen knocked in the rebound of a Gabi Jiminez shot. The second half was a slugfest between two exhausted teams. It wasn't pretty hockey, but there were moments of brilliance -- Farah Farjood making a great defensive save on a Scripps corner and Torrey nearly taking the lead on a counterattack fastbreak, Shannon Yogerst slipping a pass to Clare Young whose shot just missed wide left. Rather than play a 10-minute overtime, the two coaches decided to go straight to strokes. The Falcons weren't nearly as crisp their shootout with Serra earlier in the day: Scripps hit its first three strokes, Torrey missed its first three and the trophy went to the defending CIF champs. Still, the Falcons seemed more than pleased with their silver medal. They had gone further in the Serra Tourney than anyone (including themselves) had expected and knocked off four Top 10 teams along the way including No. 1 Serra. Game Notes: Torrey blazed through the tournament with a record of five wins and only on loss. The Falcons outscored their opponents 21-3 . . . The second place was the highest Torrey has finished in the annual tournament since 2004. In a battle of the No. 1 and No. 3 teams in San Diego County, Serra beat Torrey Pines 3-2 on Wednesday afternoon in a nail-biter on the road in Tierrasanta. The Falcons gave the top-ranked and undefeated Conquistadors all they could handle on their home turf, dominating long stretches of the game and earning more corners than the talented Qs. Both teams had their chances in a very evenly played first half. The only score came with about 10 minutes left until intermission when Serra earned a short corner on a five-yard call against a Torrey defender. Serra came out smoking at the start of the second half, earning a flurry of corners. Falcons senior keeper Grace Trupe rejected several great Conquistador shots, but Serra eventually scored their second goal on a long rebound of a goalie stop about eight minutes into the half. Torrey answered with three short corners of their own, but couldn't score. With 13 minutes to play, Serra extended their lead to three with another short corner goal on a trick play. The game seemed over at the point, with Serra cruising to an easy victory. But the gutsy Falcons wouldn't quit. Mounting a spirited attack, Torrey drew two consequtive short corners. The first one was thwarted by a Serra foul. On the follow-up corner. Sophomore Gabi Jimenez sent a rocket shot into the circle. The Serra keeper stopped the shot, but sophomore Shannon Yogerst was able to control the rebound. She faked right and passed across the goal mouth to freshman Callie Petrey-Juarez who tipped the ball to Madison Cohen on the back post for Torrey's first goal. Less than a minute later, senior Alie Zimmer drew another corner when she was fouled taking the ball into the circle. Cohen inserted to Zimmer, who dished off to Jimenez for a blazing shot into the upper left-hand corner of the Serra cage. Suddenly it was a one-goal game and all of the momentum in Torrey's favor. The final nine minutes was exciting, all-out hockey from both sides. Trupe made two great saves on late Serra shots. But the Falcons could not get the equalizer. The JV Falcons dropped a 0-6 decision to their Serra counterparts. Torrey Pines went undefeated and easily won its pool at the first round of the Serra Tournament. Playing in Pool D, the Falcons beat Mira Mesa 10-0, Cathedral 1-0 and LCC 2-0 to book their ticket to the championship round. Even though the seniors provided the bulk of the scoring, it was a day on which the Falcons' talented sophomore class finally came into their own -- Dani Jackel recorded her first varsity goal, Gabi Jimenez perfected her reverse chip, Sammy Cirino morphed into a scoring machine, Shannon Yogerst proved incredibly adept at drawing short corners, Farah Farjood and Rylie Pope showed that underclassmen can also play awesome defense, and Katie Gitre continued to sparkle in goal. The Falcons scored in the first few minutes on a short corner blast from Gabi Jimenez and never looked back. Senior forward Madi Coughlin scored three times, sophomore middy Sammy Cirino twice, while Madison Cohen, Clare Young, Dani Jackel and Alie Zimmer tallied once each to round out the Torrey scoring. Farah Farjood and Shannon Yogerst chipped in with assists as the Falcons outshot the Marauders 32-0 and racked up 13 short corners to none for Mira Mesa. Grace Trupe earned the shutout in goal but didn't have to make a single save. From goal flood to goal droubt, the tournament's second ws much different for the Falcons. Torrey dominated long stretches, outshooting the Dons 13 and three and chalking up seven short corners to just one for Cathedral. Sammy Cirino scored the game's only goal on a pass from Alie Zimmer with three minutes to play in the first half. But their were other highlights -- Falcons sophomore keeper Katie Gitre charing way out of the goal to stuff a Cathedral breakaway early in the second half, freshman forward Callie Petrey-Juarez nearly scoring on a breakaway of her own, soph forward Shannon Yogerst earning four of Torrey's corners with solo attacks into the circle, and soph middy Gabi Jimenez missing by inches with a rocket off a short corner with a minute left in the game. Playing their second game in eight days against their former archrivals, the Falcons came away with a 2-0 win over a scrappy LCC team. Madi Coughlin, Sammy Cirino and Shannon Yogerst blasted early shots that just missed or were batted away by the Maverick goalie. It was Gaby Jimenez who finally put the Falcons in front -- on a pretty near perfect reverse chip with two minutes left in the first half. Coughlin scored early in the second half on a dish from Jimenez and senior keeper Grace Trupe kept the Mavs at bay with several great stops over the last 25 minutes. 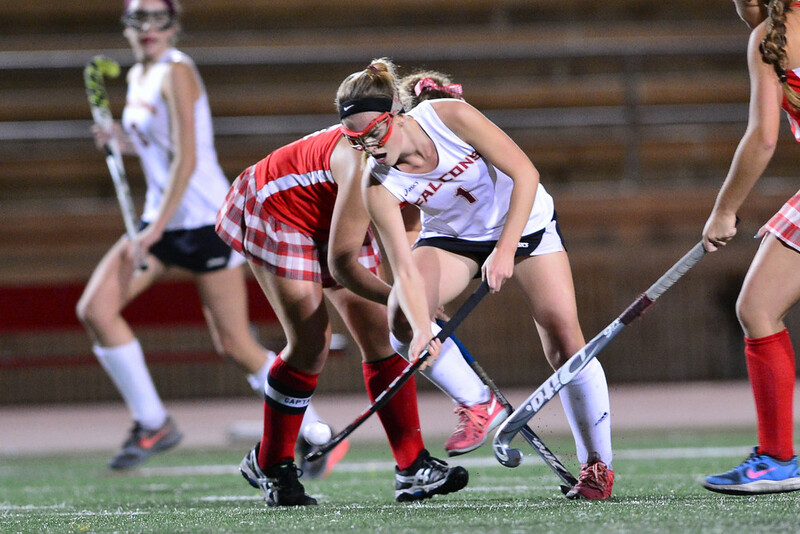 Fallbrook scored with ten seconds left in the game to give the Warriors a 2-1 victory over Torrey Pines. For the third time in four games, the refs played a major role in deciding whether or not something was a goal, and this time the call went against the Falcons as they lost their first game of the 2013 season. Torrey Pines dominated ball control and had Fallbrook pinned in its own half for much of the game. The Falcons grabbed an early lead when Madison Cohen tipped in a Madi Coughlin pass about five minutes into the game. The Warriors tied it up on a short corner about 10 minutes into the second half. After a Torrey time out, the Falcons went on the attack again. Alie Zimmer, Argerey Stapakis and Shannon Yogerst got off good shots in the final 20 minutes that were either turned away by the Warriors keeper or just missed to right or left. With the clock winding down, Fallbrook earned one last short corner. The initial shot was shoulder high and sailed through a group of three or four players before Falcons goalie Katie Gitre slapped it away. The rebound pinballed around the circle before the Warriors got off a second shot that hit the back of the cage. A moment of hesitation followed, players from both teams looking around at the refs to see what they would call. And when one of them finally signaled goal, the Torrey players protested, claiming the ball had entered the cage via a hole in the side of the netting. The two refs huddled at the top of the circle and discussed the matter for several minutes before once again signaling that the goal was good. The JV Falcons lost 1-0 to the Fallbrook. The Torrey Pines Junior Varsity team won three out of its four games at the Serra JV Tournament on Saturday. The Falcons beat Cathedral 1-0, Mira Mesa 2-0 and Otay Ranch 2-0 before falling to Fallbrook 2-0 in the playoff bracket. Junior midfielder Clare Young scored two minutes into overtime to give Torrey Pines a nail-biting 2-1 win over archrival La Costa Canyon on the road in Carlsbad yesterday. It was a tail of two halves, the Falcons dominating the first 30 minutes and the Mavericks largely controlling the second half in a scrappy game that could have gone either way during regulation. Overtime was another matter all together. Much as they had against Scripps three days earlier, the Falcons shined in 7v7, going on the attack at once and creating several scoring opportunities. All of the scoring in regulation came in the first and last minute. Torrey took an early lead on a short corner play, Madison Cohen scoring from the back post on a perfect pass from Alie Zimmer. The Falcons nearly scored again on another short corner 18 minutes in. They had another good chance on yet another corner right before the halftime whistle, a shot that went wide left. At the other end of the field Grace Trupe trned away the Maverick's only two shots of the first half. LCC was a totally different team in the second half. Battling hard in the midfield and beating Torrey to nearly every ball, the Mavs went on the attack and had the Falcons pinned deep in their own zone for much of the period. Katie Gitre mad several spectacular saves to preserve the Falcons lead, but with so many chances it seemed just a matter of time before LCC scored. They appeared to tie the game with around five minutes to play, but the whistle had already blown for a short corner and the goal was nullified by the refs. In the final minute of regulation, the Mavs found the back of the cage again on a rebound off a dangerous high ball that nearly hit several Torrey defenders. The two refs conferred again -- and decided not to call a foul against LCC -- before signaling that the goal was good and the game tied. The overtime was brief and totally dominated by Torrey. Zimmer got off an early shot that was blocked by the Maverick keeper. LCC tried to counterattack, but the Falcons stole the ball back at midfield and mounted a fast break that produced a Meaghan Donnelly shot on goal. Second later, Zimmer sent a pass from the right side of the circle to a wide open Young (in front of the cage) who zinged the winning shot past the LCC goalie. The JV Falcons lost 1-0 to their Maverick counterparts. Sophomore midfielder Sammi Cirino scored twice in the first half to lead Torrey Pines to a 3-0 victory over the visiting Vista Panthers on Wednesday afternoon, the Falcons' third straight victory to start the 2013 season. Given Vista's tradition for tough defense and great goalies, everyone expected a close, low-scoring affair as Panther-Falcon games almost always are. But Torrey was in attack mode from the start, drawing several quick short corners. They finally scored on a counterattack about 13 minutes into the game. Charging into the circle, Alie Zimmer sent a pinpoint pass to a wide open Cirino on the left post. The Falcons continued to rack up the short corners, scoring again in the 20th minute when Cirino knocked the rebound of a Gabi Jimenez shot into the back of the cage. The offensive blitz continued in the second half, a flurry of corners and shots by Zimmer, Clare Young and Shannon Yogerst that just missed. At the other end of the field, the Torrey back line of Madison Cohen Argerey Stapakis and Farah Farjood was holding the Panthers to a single shot on goal. The Falcons picked up their third goal and final score around halfway through the second frame, as Cohen tipped in a rocket shot by Jimenez off a short corner. The JV Falcons dropped a 2-0 decision to the junior Panthers. Game notes: The three-goal margin was Torrey's widest over Vista since a 4-0 win in 2007 . . . Torrey chalked up 16 corners to 6 for Vista . . . Grace Trupe and Katie Gitre shared the shutout in goal, with Gitre turning away the only Panther shot on goal. Senior midfielder Alie Zimmer scored five minutes into overtime and sophomore keeper Katie Gitre turned away 11 shot on goal as Torrey Pines beat defending CIF champion Scripps Ranch 1-0 this afternoon at Falcons Stadium. The win was sweet revenge for last year’s overtime loss to Scripps during the regular season and ended Torrey’s six-game losing streak against San Diego’s other Falcons stretching back to the fall of 2009. Torrey got off to a quick start, earning two corners in the first three minutes. But the tide quickly changed in favor of Scripps, which took control of the midfield and kept play bottled up in Torrey’s end of the field for much of the first half. The visitors racked up nine straight corners. But a combination of Gitre’s goalkeeping, Madison Cohen’s solid defense and a little luck kept the game scoreless going into intermission. It looked like Scripps was going to pick up right where they left off at the start of the second half. But several key events changed the flow of the game. Scripps was slapped with a green card (five yards) and had to play a man down for several minutes, during which Torrey mounted its first serious threat since early in the game. The Falcons didn’t score, but it gave them the confidence they had so lacked in the first half. Not long after, Gitre made a brilliant save on a breakaway by three unmarked Scripps players. Then came the real turning point: a controversial penalty stroke with about five minutes to play that Gitre also turned away. With just seconds left in regulation, Scripps hit the right post on another shot. And the game went into overtime. The ball basically stayed in the midfield during the opening minutes of extra time, neither team getting off a shot or serious offensive threat. But around five minutes in, Zimmer found an opening and took the ball up the left side on a breakaway. A Scripps defender eventually caught up and interfered with Zimmer. On the ensuing short corner, Clare Young flicked a pass across the top of the circle to Zimmer, who got off a rocket shot on the café. A diving Scripps defender got her stick on the ball, which popped into the air and over the keeper’s head for the game’s only goal. The JV Falcons played hard but eventually gave up a pair of second-half goals and lost to Scripps Ranch 2-0 in the warm-up game. Torrey Pines kicked off the 2013 field hockey season in fine style by trouncing Otay Ranch High School 8-0 on the road in Chula Vista. Five different Falcons scored in the offensive explosion – the most goals Torrey has scored in a game and the widest margin of victory since 2008 when the Falcons last won CIF. The flurry of goals was even more impressive given that the game was played on grass (much of it thick and uneven). Otay Ranch started off on the attack, but the Falcons quickly turned the momentum in their own favor. Shannon Yogerst notched the game first goal off a nice flick pass from Gabi Jimenez about eight minutes into the first half. Five minutes later, Clare Young scored off a dish from Madison Cohen after a short corner to make it 2-0. Alie Zimmer tallied Torrey’s third goal off a looping pass from Yogerst and then added the fourth on a penalty stroke after a Mustang defender whacked the Falcon midfielder across the back with her stick and got ejected. With the Mustangs playing a person down the entire second half (due to the ejection), the Falcons offensive show continued. Madi Coughlin scored off a Cohen assist on a short corner. Cohen then snatched her own goal on a pass from Jimenez shot. Yogerst scored her second goal on a rebound off the Otay keeper’s pads that she chipped into the upper left-hand side of the cage. And then Coughlin scored her second by deflecting a Zimmer rocket into the goal. The JV Falcons beat their Otay counterparts 1-0 on a goal by sophomore Debbie Choi. Game Notes: Senior keeper Grace Trupe and sophomore goalie Katie Gitre shared the shutout; Trupe stopped three Otay shots in the first half but the Mustangs did not get off a single shot (on goal or otherwise) in the second frame . . . next up for Torrey Pines is defending CIF Division One champion Scripps Ranch, who beat the Falcons twice last year (5-0 and 3-2 in OT). Scripps visits Falcons Stadium on Tuesday afternoon. For the second time in three years, the Falcons get the nod in this category on the strength of winning five CIF San Diego Section crowns and one CIF state title. The state title came in golf, the five section titles in golf, tennis, volleyball, softball and swimming. 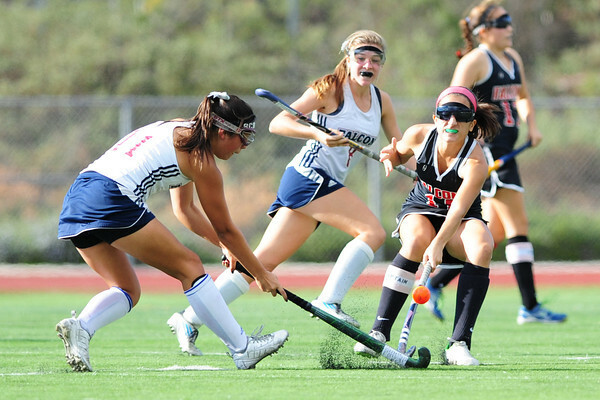 Read the full story at TP is named the #1 school for Girls Sports in CA! 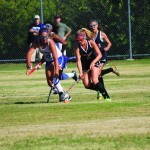 So, "My daughter has been playing field hockey for years, and this game still seems so confusing. What's a parent to do?" Simple, take a look at the US Field Hockey basic rules. It's a short read and, coupled with the links on the page will provide everything (and more than) you'll need to know and will answer all of the questions you may have about the game. One of the most confusing aspects of watching the game is deciphering the frequent referee whistles. Here is a link which describes referee signals (or chart). Also, the wikipedia field hockey page provides a bit more concise synopsis of the game. We always need photos at the games and anything related to team activities that would be fun to share with everyone. Also, for the JV games we need reports of game scores or even a short write-up about the game (or whatever you're motivated to write). We can accept information in any form: electronic images or write-ups by email to joeyogerst@gmail.com.